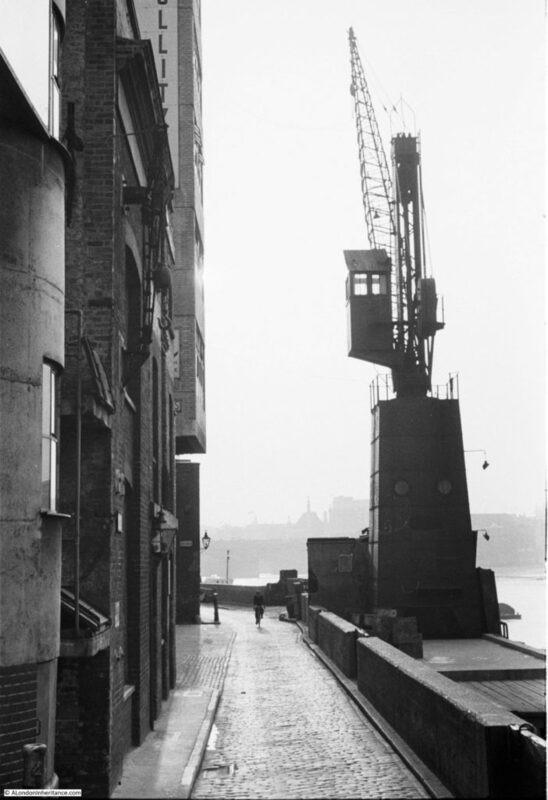 I have covered Bankside a number of times, however in this week’s post I want to show a different perspective of Bankside, as it was in 1947 from the north bank of the River Thames, before any of the developments that would transform the area from industrial to the arts and leisure Bankside that we see today. 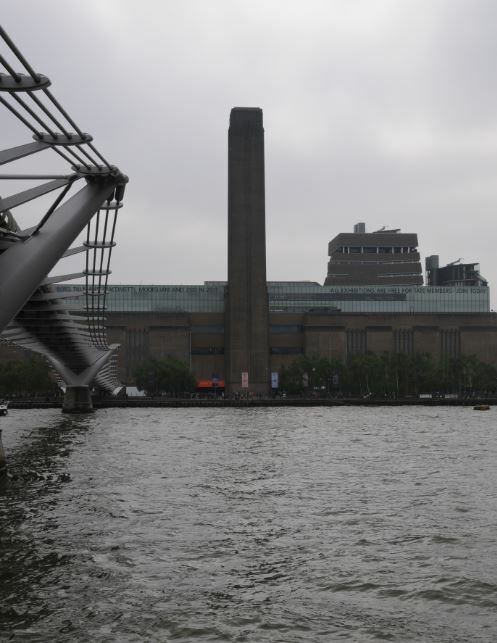 For the post, I am covering the area of Bankside from Tate Modern (the old Bankside Power Station) up to Southwark Bridge. 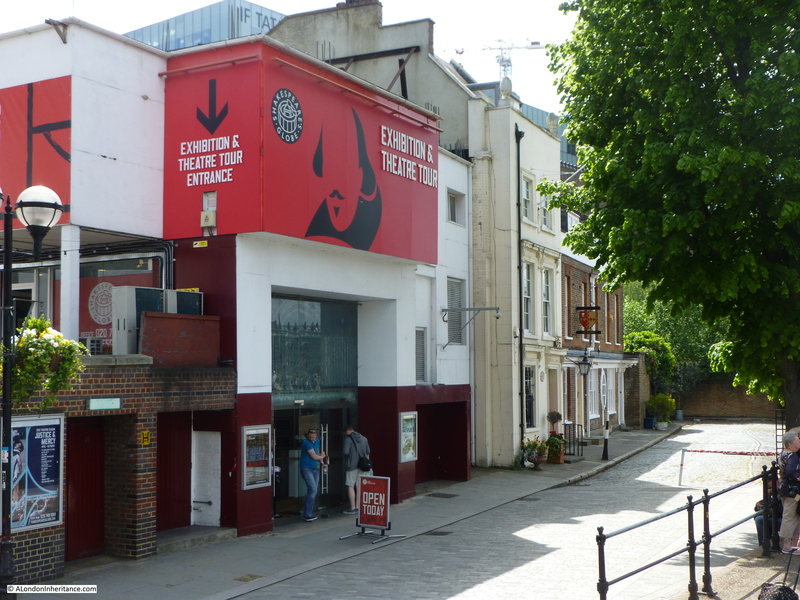 In the centre of the 2017 photo, behind the two trees is the Globe Theatre. To the right of this are the only couple of buildings that are the same in the two photos. Just behind the tree to the right of the Globe is 49 Bankside, the three storey white building (I covered 49 Bankside and Cardinal Cap Alley in detail in a post which can be found here). To the right of 49 Bankside is a short row of houses, which again are the same in both photos. Everything else in the two photos has changed. The building immediately to the left of 49 Bankside in the 1947 photo was the office and factory of Craig and Rose. Their name can be seen in large white letters along the top of the first floor. Between the ground and first floors are the words “Forth Bridge Brand Paints”. Craig and Rose were a paint manufacturer who are still in business today and claim to be the UK’s oldest independent paint manufacturer. The company was established in 1829 by James Craig and Hugh Rose, two Scottish entrepreneurs who set up the business in Edinburgh. The business expanded rapidly and in 1880 won the contract to supply paint for the Forth Bridge, with their Red Oxide paint being supplied to paint the bridge until 1993. The Bankside building was constructed in 1897 for Craig and Rose, and operated until the early 1950s. Craig and Rose are now based in Scotland. When I was sorting through my files of scans of my father’s photos I found the following photo which was taken on the same day as the above 1947 photo. This is of the original Bankside Power Station on the left and the Phoenix Gas Works on the right. I wrote about the original Bankside Power Station in this post where there are photos of the first phase of the new power station built over the site of the gasworks. On the left of the above photo is a conveyor belt running from almost the top of the power station down to the ground on the extreme left of the photo. I believe this was to transport coal into the power station ready to be burnt. 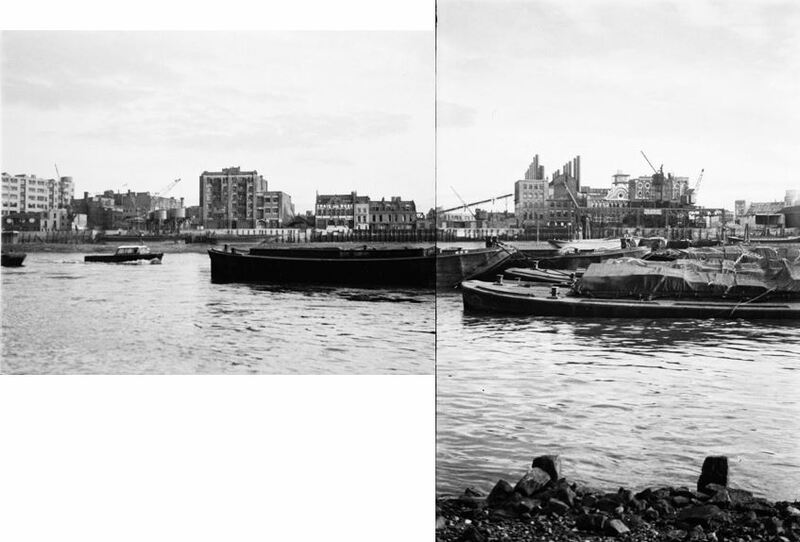 And with a bit of cropping and some very amateur joining of photos I present a Bankside Panorama in 1947 and seventy years later in 2017. Only a small part of the Millennium Bridge is shown as for the photo on the left, I had to take this from almost under the bridge to provide a slightly angled view otherwise with a straight on view, 49 Bankside, the key building in both 1947 and 2017 was obscured by the tree. I am not sure what is the most remarkable – that this stretch of Bankside has changed so much, or that 49 Bankside and the short row of houses to the right have managed to survive when everything else along this stretch of the river has been redeveloped. The two photos also show how use of the river has changed. 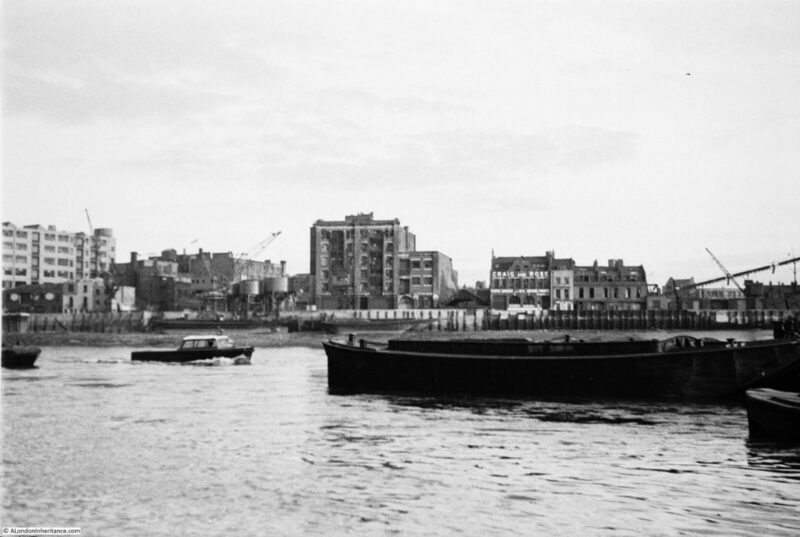 In 1947 the river was busy with lighters and barges moored along the river. Today, the river is quiet apart from tourist boats and the Thames Clipper river buses. 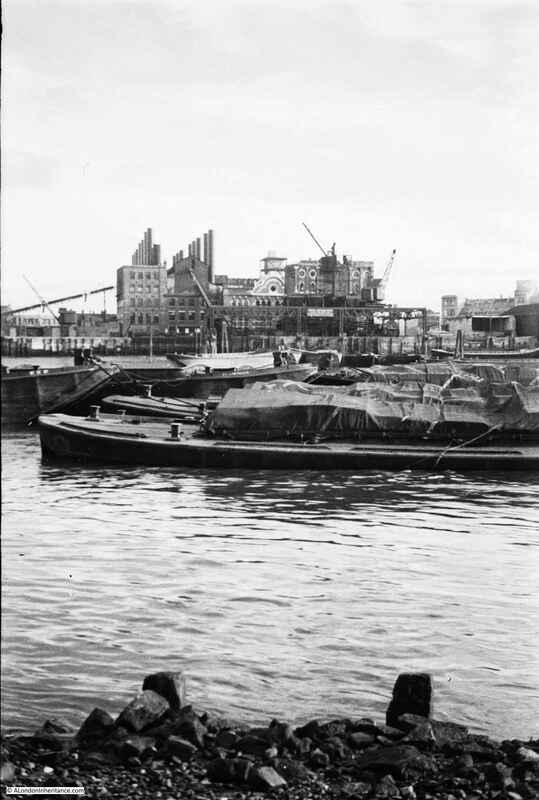 I believe the moving boat on the left of the 1947 photo is a police launch as it looks identical to photos I have of moored police launches by Waterloo Bridge. 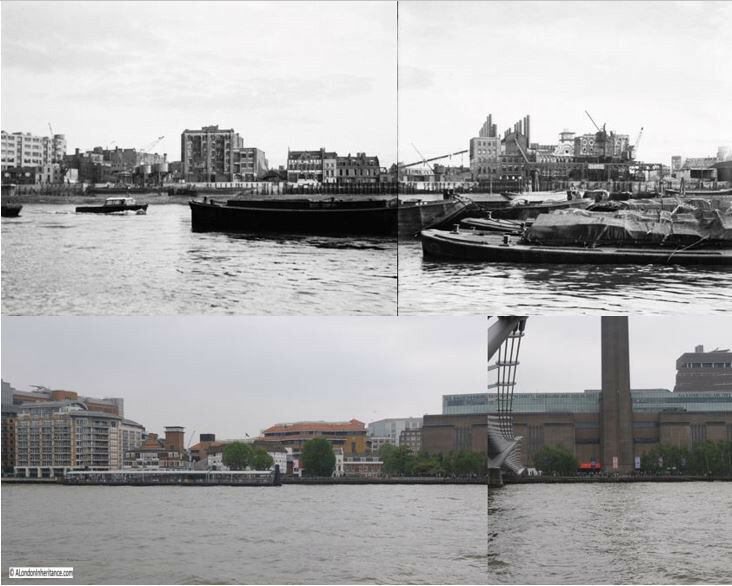 It was interesting to stand on the north bank of the river with the 1947 Bankside panorama in hand, looking at the view of Bankside seventy years later. I do need to return when the leaves have fallen from the tree in front of number 49, and the lighting is better so I can get an improved 2017 view, with the bridge and avoiding the grey backdrop, however I hope you find the two panoramas of Bankside as interesting as I have. 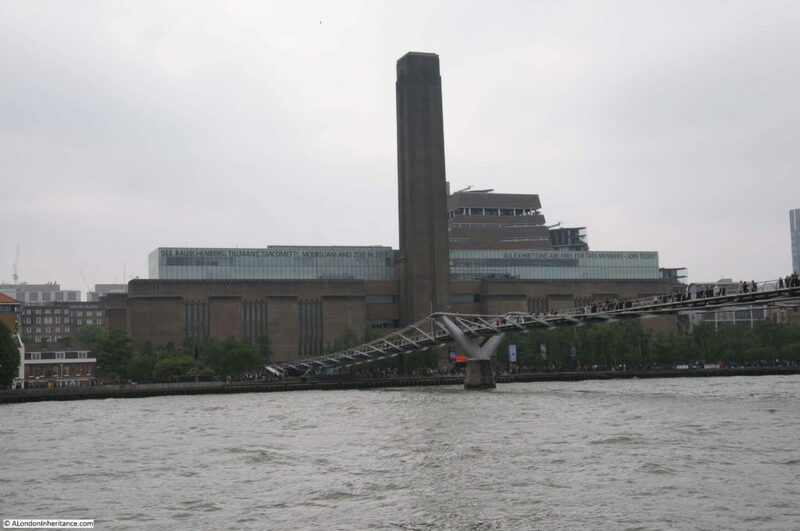 This entry was posted in London Vistas and tagged Bankside, Bankside Power Station, Tate Modern, The Globe on October 8, 2017 by admin. 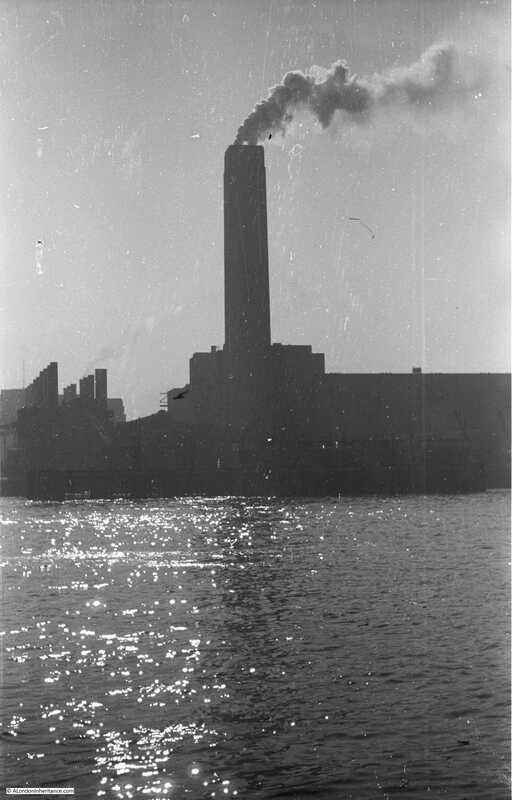 In 1953, soon after it started operation, my father took the photo below of Bankside Power Station. The photo suffers from a problem I often have when taking a photo of the southern bank of the river from the north on a clear day as the sun is in the south and puts the power station into silhouette. 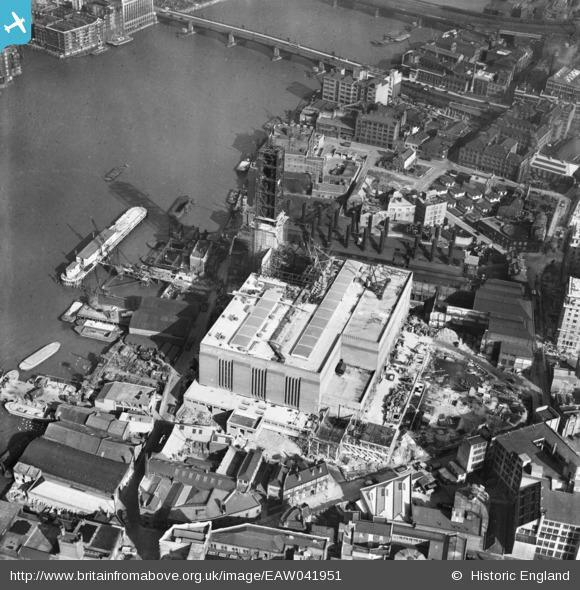 In the photo, Bankside Power Station also looks only half built, which indeed it was. There is a smaller building on the left with two rows of chimneys receding from the river’s edge. This is the original power station on the site. Roughly the same view today. The Millennium Bridge now crosses the river in front of the old Bankside Power Station building. A view from further along the river showing the full size of the former Bankside Power Station building. 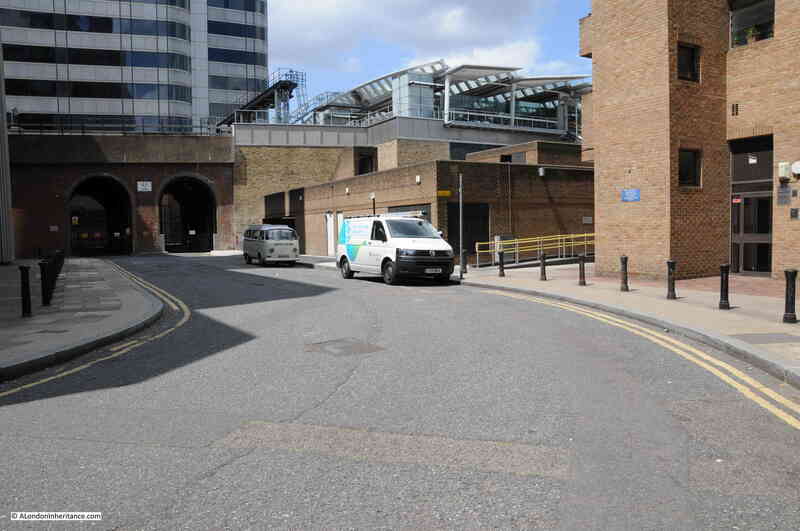 This area of Bankside has produced energy for many years before the current Bankside Power Station was built. The following extract from the 1892 Ordnance Survey map shows towards the right of the map an Electric Lighting Works and on the left the Phoenix Gas Works. Both of these industries were located adjacent to the river as they both used coal to generate either electricity or gas. 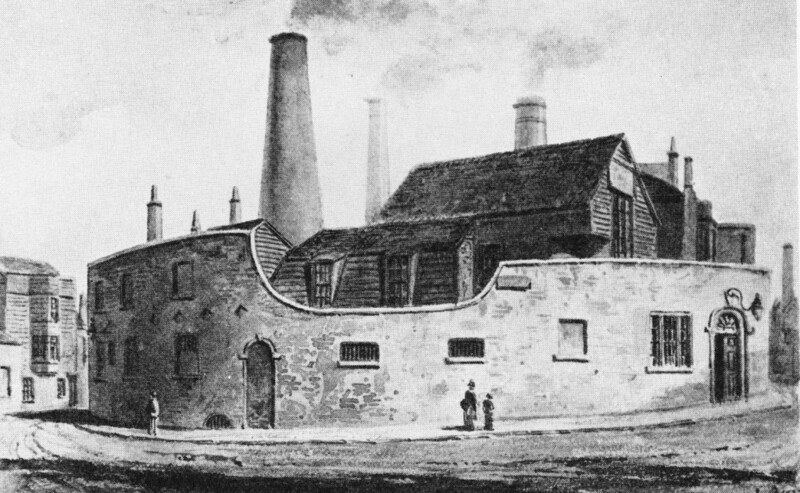 The original power station was built by the City of London Electric Lighting Company in 1891 and over the years underwent a number of extensions and upgrades to form the building with the two rows of chimneys as seen in may father’s photo. Each chimney was connected to an individual boiler and a separate building contained the generator that was driven by the steam from the boilers to produce electricity for distribution in the local area and by cables across the river to the City. Electricity generation was originally a local activity with no national grid to distribute across the country. There were power stations located across London, including the Regent’s Park Central Station where my grandfather was superintendent. The design of the original power station and the equipment used was highly polluting with so many chimneys pouring smoke, ash and grit onto Bankside. Planning during the war identified the need for a significant number of new power stations across the country with post war consumption of electricity expected to surge. London would be one of the areas where the old, polluting power stations urgently needed to be replaced with cleaner power stations with higher generation capacity. As always happens with long-term, strategic plans, events take over and problems such as power shortages during the very cold winter of 1947 forced different decisions to be made and the go ahead was given in 1947 for a new power station to be built at Bankside. In giving this approval there was one major change. Originally it was planned for the power station to continue using coal, however the level of pollution in the area, the space needed for coal storage and the need to diversify power production away from one signal source Influenced the Government to change plans for the new Bankside Power Station to switch from coal to oil. As well as being slightly less polluting, oil had the advantage that it could be stored in large underground tanks, thereby removing the need for large fuel storage areas above ground. Although oil was slightly less polluting, the new Bankside Power Station would continue to have an impact on the local area and on the river. Flue gases were washed by water taken from the river. These waters would then be returned to the river with a higher particle content and acidic level. When the go ahead was given for the new power station, as well as concerns about locating such an industry in central London, there were also complaints that the new building would dwarf St. Paul’s Cathedral. Sir Giles Gilbert Scott changed the design from dual chimneys to a single chimney and ensured that the overall height of the chimney was lower than the dome of the cathedral. This was helped with the land on which the cathedral is built being higher than the river side location of the power station, however the reduced height of the chimney did contribute to ongoing local pollution problems. 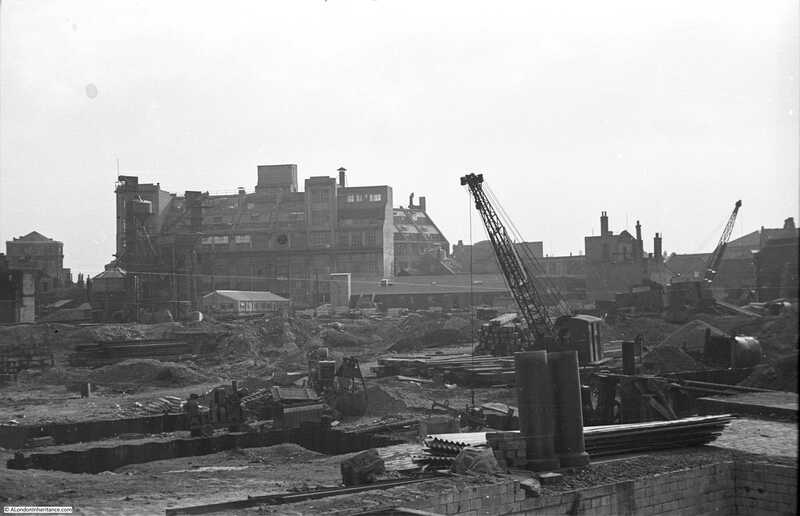 Construction of the first half of Bankside Power Station took place between 1947 and 1953. 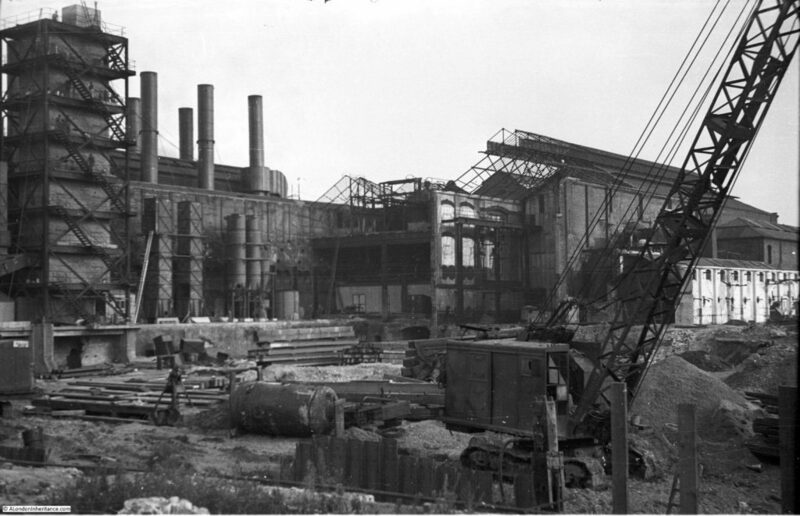 This saw the completion of the western half of the building and the central chimney with first power being generated in 1953, and this is the status of Bankside Power Station that my father photographed in the photo at the start of this post. He had also walked around the area a number of years earlier when construction first started. He took the following two photos showing the demolition of the buildings that had been on the site, and the start of construction of the new power station. In this first photo, he is standing in front of what would become the wall of the building facing to the river, at the western edge. Five chimneys on the rear of the original power station can be seen, and on the far left of the photo are the lower levels of the new chimney. I took the following photo further away from the power station than my father’s photo above. If I was much closer it would just be looking directly into the building, however it does give a view of the same scene as it is today with the base of the chimney on the left of both photos. In the above photo it is the central core of the chimney which is seen, the brick outer structure is yet to be added. The second photo is looking directly across the construction site towards the south. 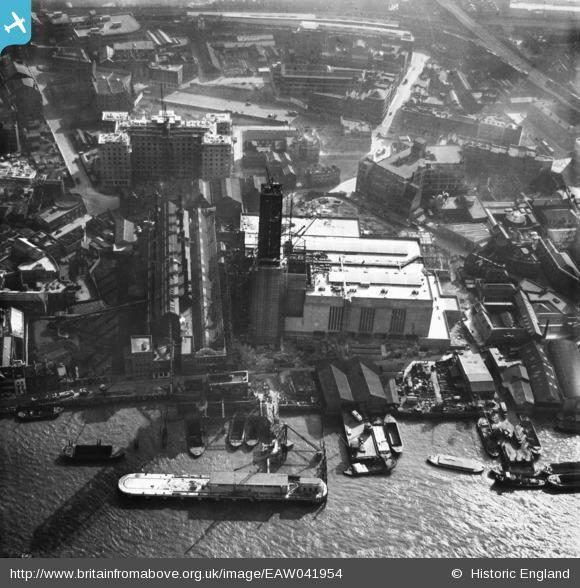 The Britain from Above website has a number of photos taken by Aerofilms which show the Bankside site under development. The first photo is from 1946 and shows the site prior to development of the new power station. The site can be located by the double row of black chimneys of the original power station which is located in the middle of the lower part of the photo. The next photo is from 1952 and shows the power station nearing completion. 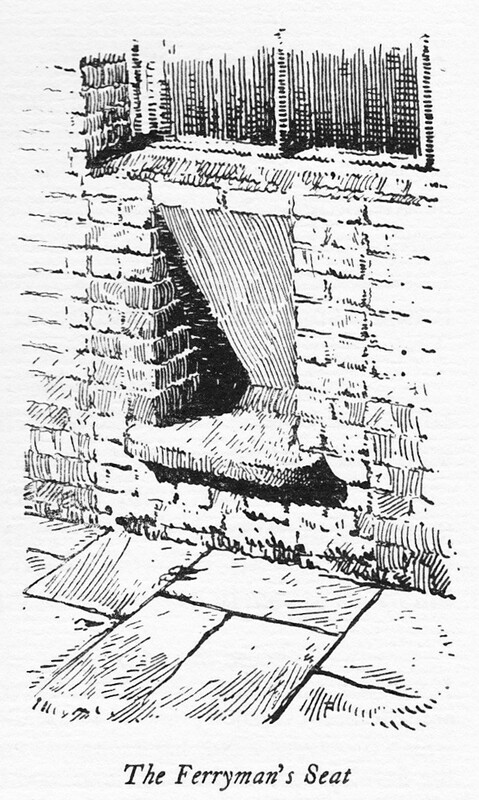 The core of the chimney is complete, but it lacks the outer brick facing. The metal framework around the upper part of the chimney is the same structure as shown on the lower part of the chimney in my father’s photo. 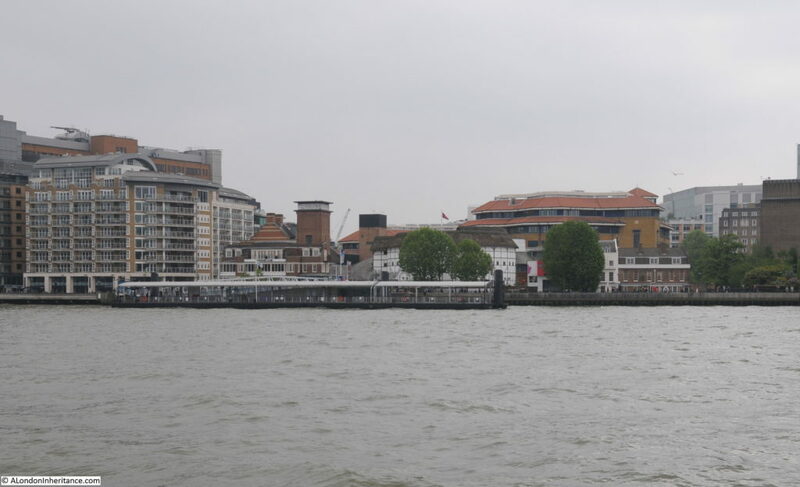 The original power station can clearly be seen covering the land where the second half of the new Bankside Power Station would later be built. The next photo is also from 1952 and shows the power station looking from the north. 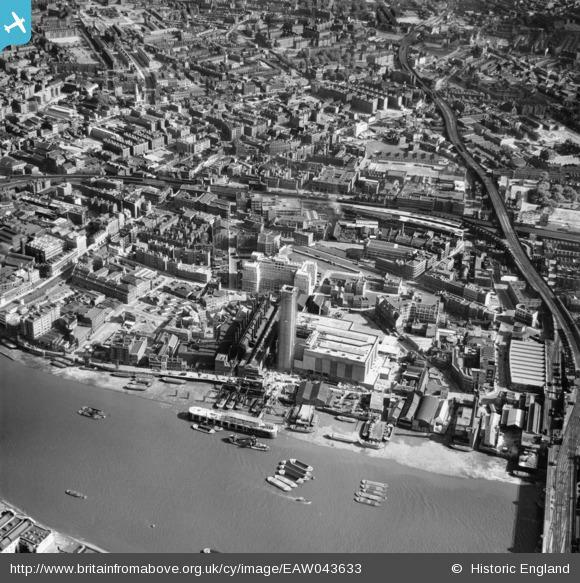 This again shows the original power station to the left of the new Bankside power station. And the final photo in June 1952, a couple of months after the above photos now shows the main building and chimney almost complete. The photo also shows the structures on the river that allowed oil tankers to dock and unload their cargoes into the underground tanks of the power station. Both the old and new Bankside Power Stations continued in operation until 1959 when the old power station was finally decommissioned and demolished. The second half of the new power station was built between 1959 and 1963 by when the building we see today was finally in place. In all, around 4.2 million bricks were used on the external walls of the building and chimney. The oil crisis during the 1970s had a considerable impact on the financial viability of oil fired power stations. The power station was also continuing to pollute the local area and the river. Power stations were also being built out of cities and there were now power stations further down the Thames. The continued operation of Bankside Power Station could no longer be justified and electricity generation finally ended at Bankside in 1981, almost 100 years from the first, small steps in electricity generation on the site. 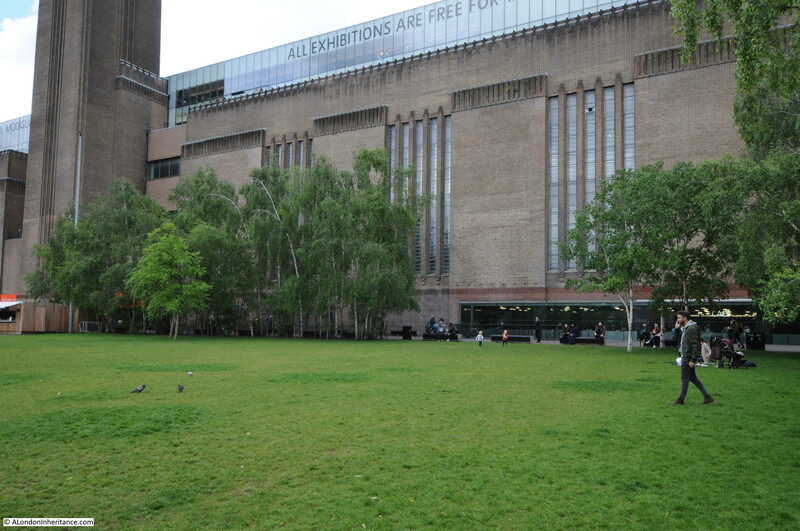 The building remained unused for a number of years until plans were put in place to transform the building into Tate Modern. A competition was held for a new design which was won by the firm of Herzog & de Meuron. Their design made very few changes to the external structure of the building so the original design of Sir Giles Gilbert Scott is basically the building we see on Bankside today. Bankside Power Station is a wonderful building. It is from an era when power stations were built as cathedrals of power, Battersea Power Station being another example of the style. The preservation of the external structure of the building and that now through Tate Modern it is fully open is to be appreciated. This entry was posted in London Buildings and tagged Bankside, Bankside Power Station on May 21, 2017 by admin. This short stretch of Bankside is completely different from 1953. 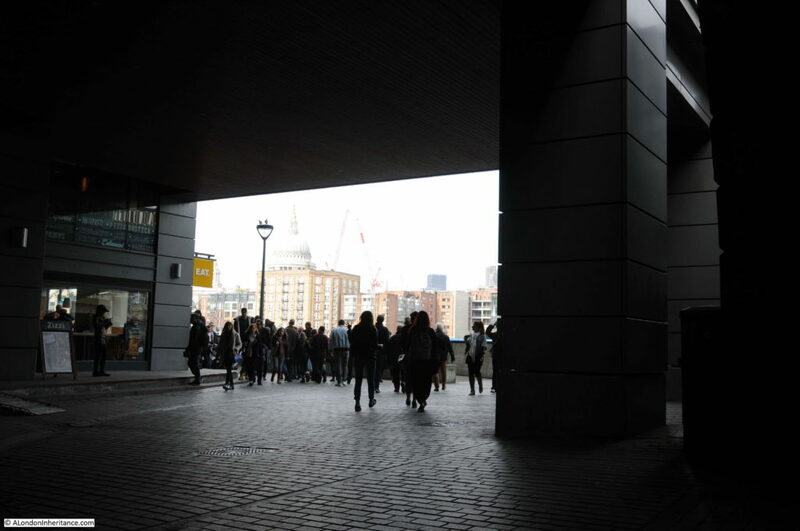 A straight length of river wall and walkway now lines the river between Southwark Bridge and the railway bridge into Cannon Street station. The warehouses have been replaced by two office buildings and the cranes and infrastructure along the river have long since disappeared. The changes since 1953 also include where the Bankside walkway is located and the alignment of the river wall. I could not take a photo in the same position as my father as I would be looking from the bridge straight into the FT building on the right. The river wall has been pushed further into the river and the edge of the buildings now cover the original Bankside roadway. In my father’s photo it was possible to look straight along Bankside and see the tower of Southwark Cathedral from the bridge. Today, this is not possible as the two new buildings obscure the view having been built over the original road (also Southwark Cathedral is hard to see due to the taller buildings directly behind). The river wall has been straightened and pushed into the river. Look at the 1953 photo and at the far end is the railway bridge. To the left of the crane you can see the brick pier of the bridge extending into the river. Today, the edge of this brick pier is now aligned with the edge of the river wall and Bankside walkway. 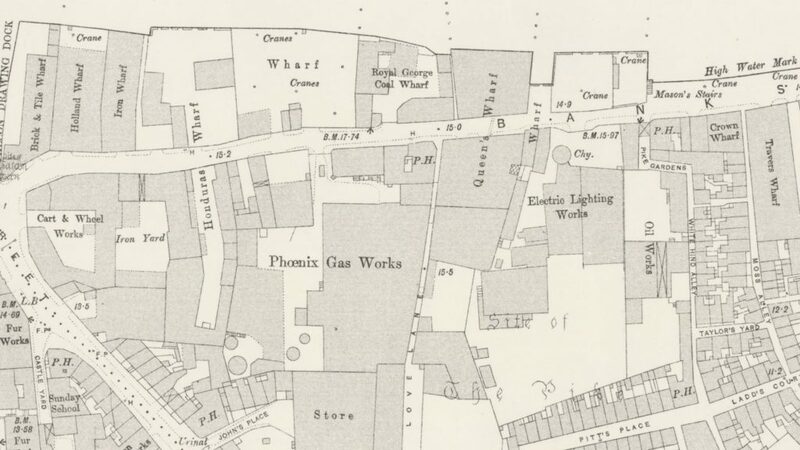 The following extract from the 1895 Ordnance Survey map shows this stretch of Bankside which I suspect had not change that much in the almost 60 years between the map and my father;s photo. It shows Bankside lined with warehouses, wharves and cranes along the river’s edge. There are a couple of features that interested me in my father’s photo. In the lower part of the photo is a solitary lamp mounted on the wall along the river and to the right is a large entrance on the ground floor of the building. What was this single lamp doing in this position? Looking at the 1895 map, the large entrance to the building on the right is the entrance to Horseshoe Alley. Covered over by the building, but opening out to an exposed alley as it heads in land. Opposite Horseshoe Alley at the water’s edge is what appears to be an opening in the river wall down to the river which can also be seen in the photo above to the left of the lamp. I then checked my copy of John Rocque’s, map from 1746. In the extract below, Horseshoe Alley is there, but also, leading down to the river is Horseshoe Alley Stairs. So perhaps this single lamp was there to mark the position of the stairs and to guide those walking up and down what would have been rather dangerous and slippery steps down to the river. 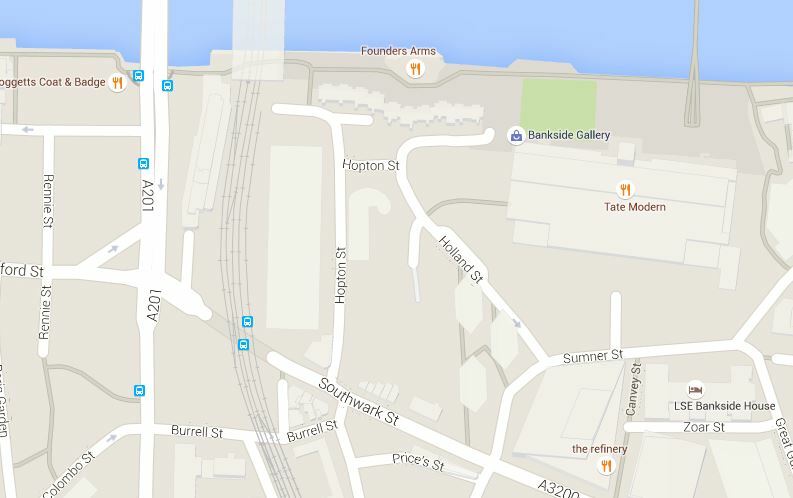 Another feature that both of the above maps confirm is where Bankside ended at the appropriately named Bank End. It is at the edge of Bank End that the bridge carrying the railway across to Cannon Street station now runs. 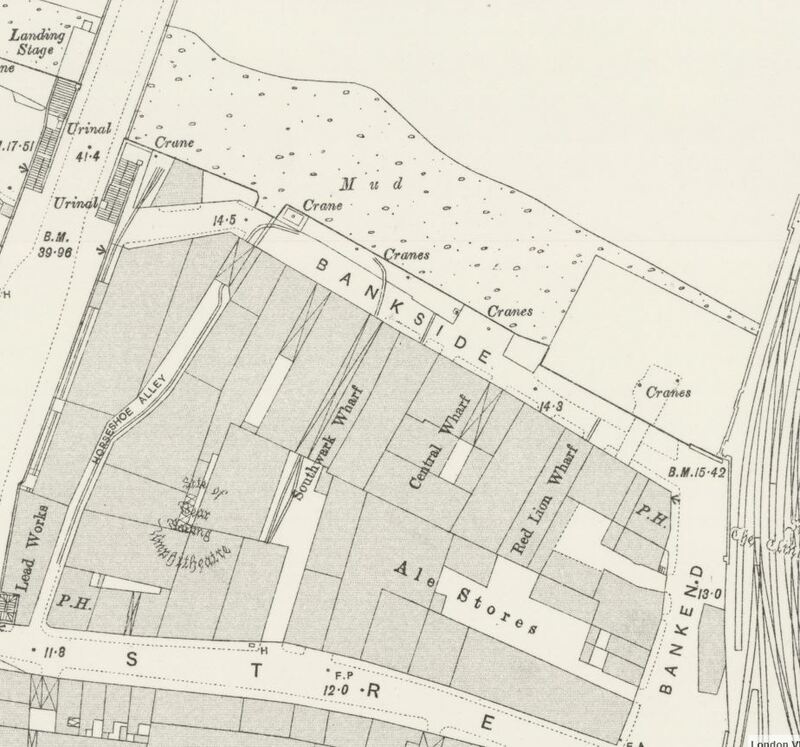 The Rocque map confirms that Bankside terminated here well before the railway bridge was built. 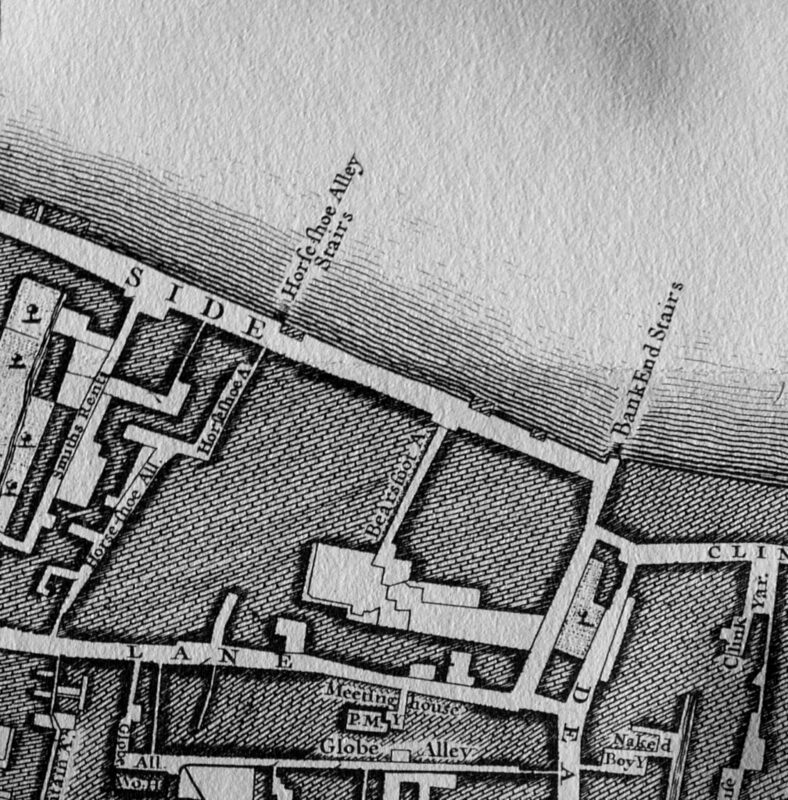 The approach road to Southwark Bridge runs over the street marked Smiths Rents on the left in the 1746 map. “The chairman said that the board had been in communication with the Metropolitan Board of Works prior to the overflow with reference to the work to be carried out; and he apprehended that it was in consequence of that not being done that the flood took place. Mr Stafford asks: But did we not delegate one of our officers to attend to the question of floods specially, in order that the flood-gates may be closed at the proper time? The surveyor (Mr Greenstreet) said that was the case. The board had appointed the clerk of the works to look after the barriers. With reference to the flood on Sunday week, he (the surveyor) was himself at Christchurch at 1 o’clock in the day. The clerk of the work’s unfortunately had only two men with him, though on such occasions he generally had four. All the dam-boards that were in use were at once put up so as to prevent the overflow of the water; but he found that at one important point-viz., Horseshoe-alley, the barricade had been removed. The water could not, therefore be prevented from coming in there, and it came up with such rapidity – more rapid, in fact, than on any previous occasion of which he had experience – that it washed away all the clay at Bank End. he found that nearly half of the dam-boards along Bankside were in an incomplete state, but some were now in proper order. The fact that the water overflowed was a pure accident that could not be prevented. Mr Stafford asked the surveyor, with reference to the board at Horseshoe-alley, whether, prior to the flood he was aware it was not in position. The surveyor replied in the negative. He only noticed its absence on the Sunday when the flood occurred, and it then struck him that the board must have been stolen. 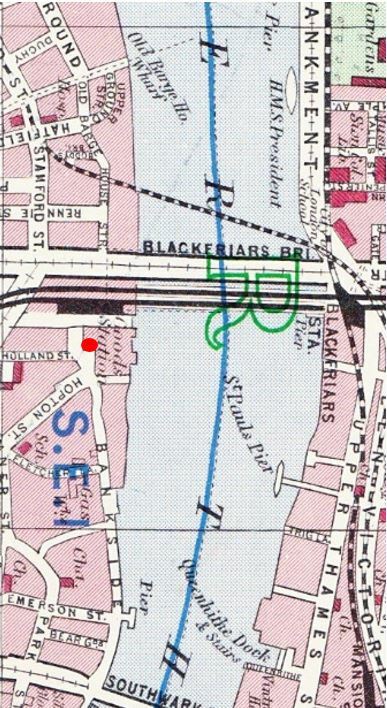 Mr. Evans mentioned that on the Sunday in question he happened to be passing over Southwark Bridge when the water was coming up, and he immediately repaired to Bankside. He met the inspector and along with that officer they did what they could to prevent an inundation. Three men were employed to put up the barricades, and they had since complained to him (Mr. Evans) that they only received half a crown each for their work. As regarded Horseshoe-alley, he found that there were no boards there, and he took it upon himself to advise the inspector of nuisances to do what he could. I suspect the surveyor may have lost his job as a decision on his future was postponed for a later meeting. The flooding referred to happened on Sunday 19th February 1882. There were frequent floods along the Thames, however the river level for this flood was one of the highest and impacted a far wider area. There were reports of high tides and floods along the East Coast, but the greatest damage was done along the Thames. The high tide on the morning of the 19th rose to above its normal height but did not give any cause for alarm, however it was the afternoon tide that went higher. 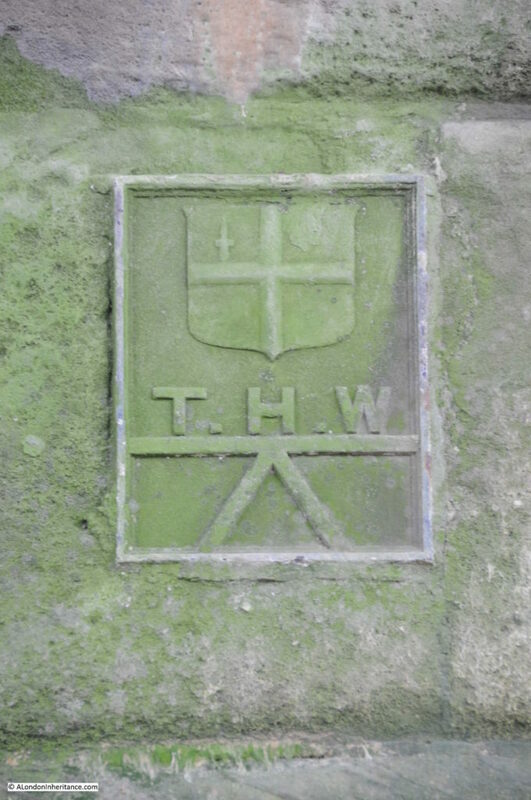 By 2:30 pm the Trinity high-water mark at London Bridge had been reached. The tide continued to rise for another 30 minutes so that by 3pm it was now 2 ft higher than the Trinity mark. The areas worse affected were Rotherhithe, Southwark and Lambeth on the south side of the river, and High Street, Wapping on the northern side. At St. Katherine’s Dock, the water level was recorded as being only 5 inches below the highest level ever recorded on the Thames which had occurred only a year earlier on the 18th January 1881. Looking back at my father’s 1953 photo it is easy now to understand the structures along the left side of the street. Heavy concrete walls, with the access points secured by heavy wooden panels slotted into the edges of the concrete walls to form a watertight seal. Apart from the bridges that form the borders to this stretch of Bankside, there is only a single building that remains from the time when my father took the 1953 photo and the 1895 map. 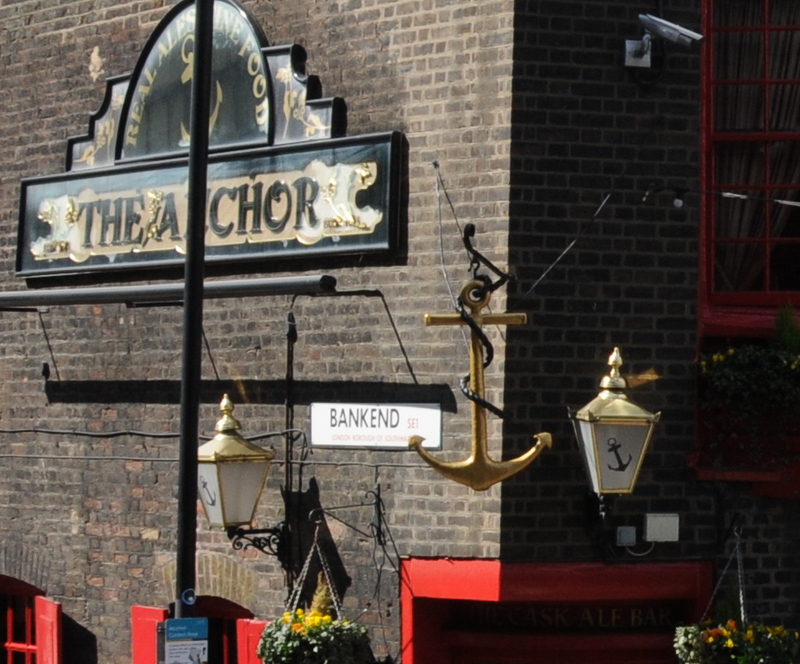 For part of the 19th Century the pub was called the Blue Anchor. In the 1953 photo there was only the relatively narrow street between the pub and the river, however today, with the straightening of the river wall out to the end of the brick pier of the bridge, there is a large open area in front of the pub – perfect for a beer on a nice day or evening. The area on the left of the above photo is Bank End, as confirmed by the name on the side of the pub, so if you stand here, this is where Bankside ends. Today, apart from the pub, this stretch of Bankside is rather bland and Horseshoe Alley and Stairs disappeared during the reconstruction which resulted in the river wall, walkway and buildings we see today. Stand here during a high Thames tide and it is easy to appreciate the challenges of protecting the land when all that was available to prevent an inundation were wooden boards . I wonder what happened to the surveyor and if he had any role in the disappearance of the Horseshoe Alley dam-boards. On a completely different subject, I recently found a copy of the film “The Proud City” on YouTube. 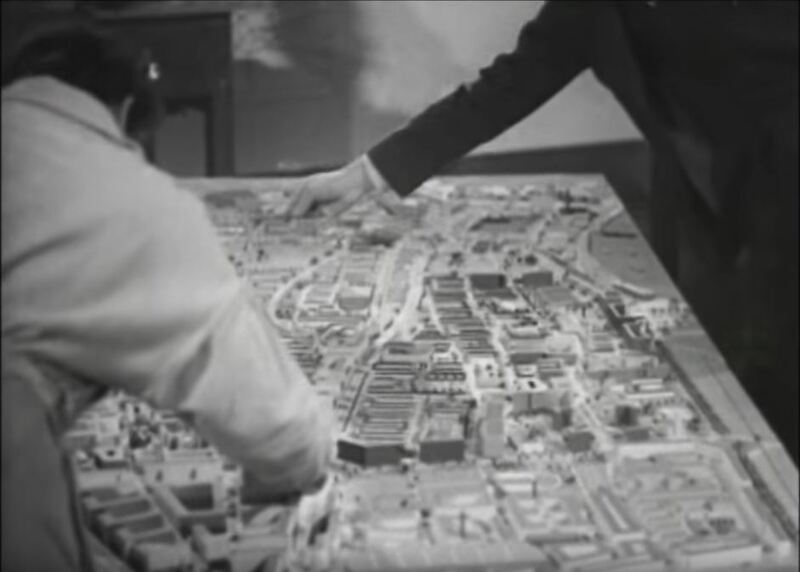 The film tells the story of the planning for the post war reconstruction of London by Patrick Abercrombie and JH Forshaw. 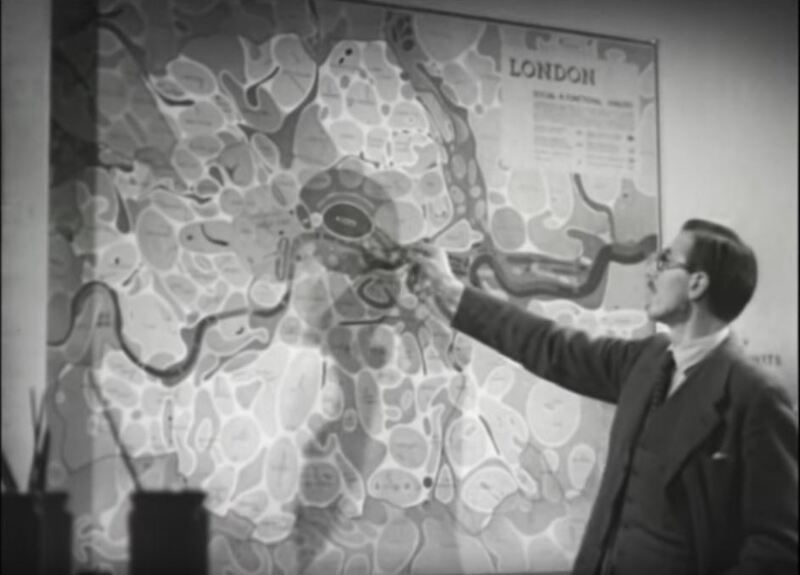 The film includes many views of London, along with Abercrombie and Forshaw explaining the background to the plan, along with some wonderful large scale posters of the maps that would be in the printed report along with models of areas to be redeveloped. The following screen shots from the film show some examples. I wonder what happened to these large wall maps. I would love to have them on my wall. I featured a number of them in my post on the 1943 plan for post war reconstruction here. The film is very much of its time, but is 25 minutes well spent to see some fascinating film of London and to understand the thinking behind the Abercrombie and Forshaw plan. The Proud City can be found here. This entry was posted in London Streets and tagged Bankside, Southwark Bridge, Southwark Cathedral on April 9, 2017 by admin. 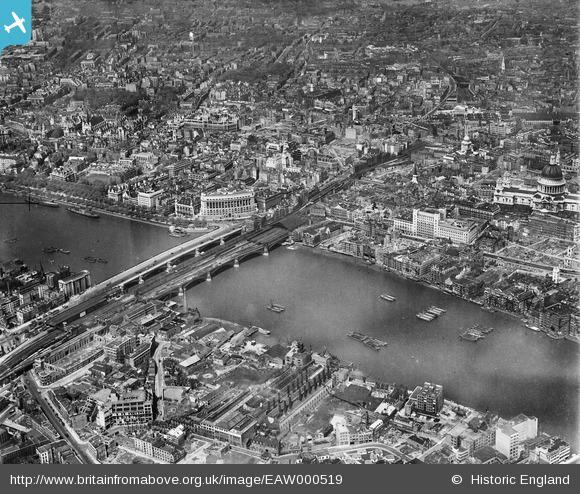 The south bank of the River Thames between Westminster and Tower Bridges has seen many changes. 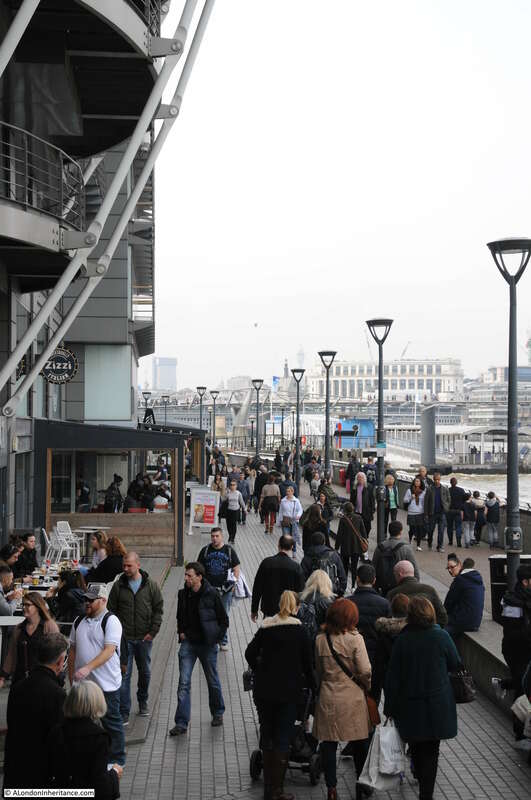 Once mainly an industrial area lined with factories, warehouses and wharves, these have been replaced by offices, restaurants, Tate Modern, the reproduction Globe Theatre etc. 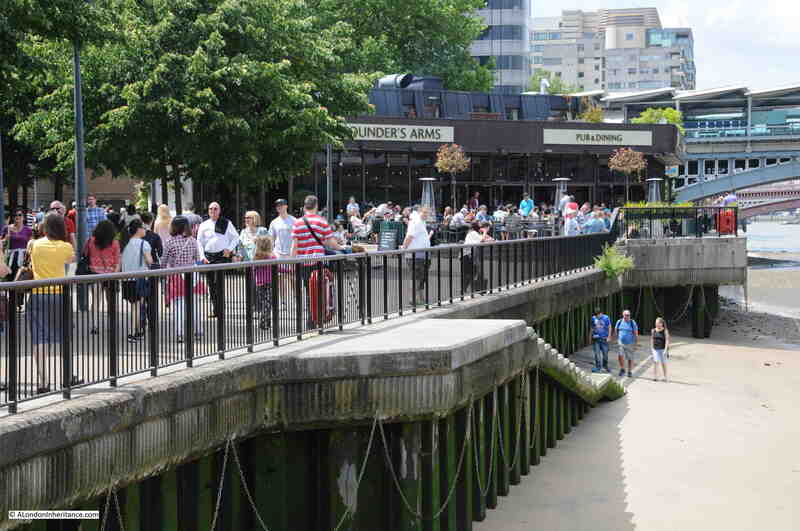 Any day of the year, the walkway along the south bank will be crowded with tourists, those who work along the south bank and as a straightforward route to walk between east and west London. The south bank was not always like this. 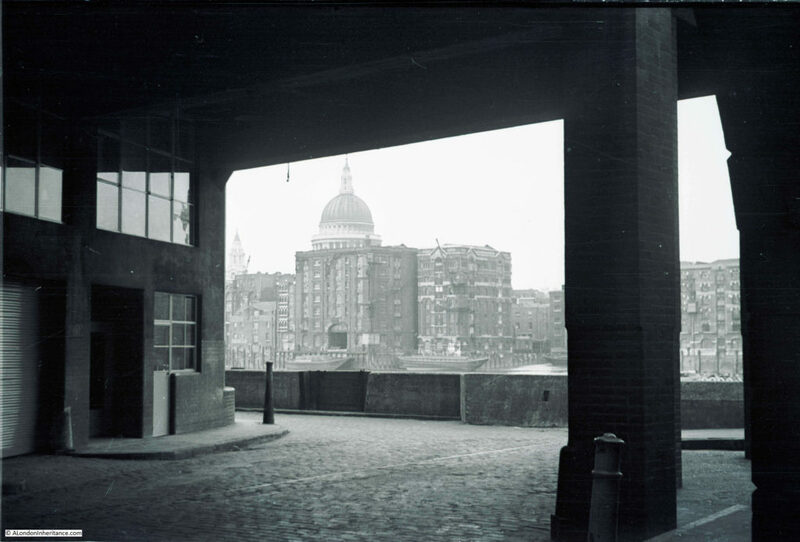 This was the view in 1953, photographed by my father, looking along Bankside, west from the base of Southwark Bridge. The photo was taken from the area of the steps leading up to the bridge. The same view in 2017. The scene is so very different, how do I know it is the same view? There are a couple of well defined points of reference. If you look to the left of the crane, there is part of a large building, with a further building just a bit further to the left with a distinctive spire on the roof. If you look in the same position in my 2017 photo, the large building is Unilever House, now fully visible as the crane is not obscuring, and the building with the spire is the old City of London school. The spire is clearly visible in both photos. You will also notice that the street (1953) and walkway (2017) curves to the left in the distance. The original photo was taken during a weekend, the shadows indicating this was late afternoon. My photo was also at the weekend, although early afternoon. The solitary cyclist has been replaced by the crowds who daily walk along the south bank. In the 1953 photo, you can see part of a name at the top of one of the buildings. The full name is Beck & Pollitzer, a successful engineering company that is still in existence today, although not on Bankside. Beck and Pollitzer was formed in 1863 by two immigrants from central Europe, John Beck and Sigimund Pollitzer. The company started as an importer and distributor of goods from across Europe and therefore needed warehouse space. In the late 19th century the company moved into warehouses on Bankside and eventually owned several on either side of Southwark Bridge. The company evolved into a specialist engineering and support services provider and moved from Bankside to Dartford in Kent. Beck & Pollitzer retain a link with London as they provide the transport and installation services for the Trafalgar Square Christmas tree. 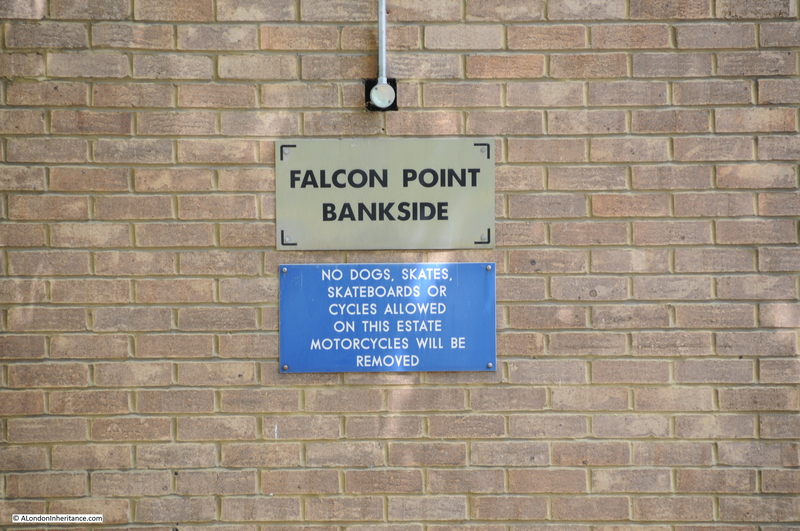 In my father’s photo, Bankside is the street that runs along the edge of the River Thames. Although today it is primarily a walkway, it is an old street. 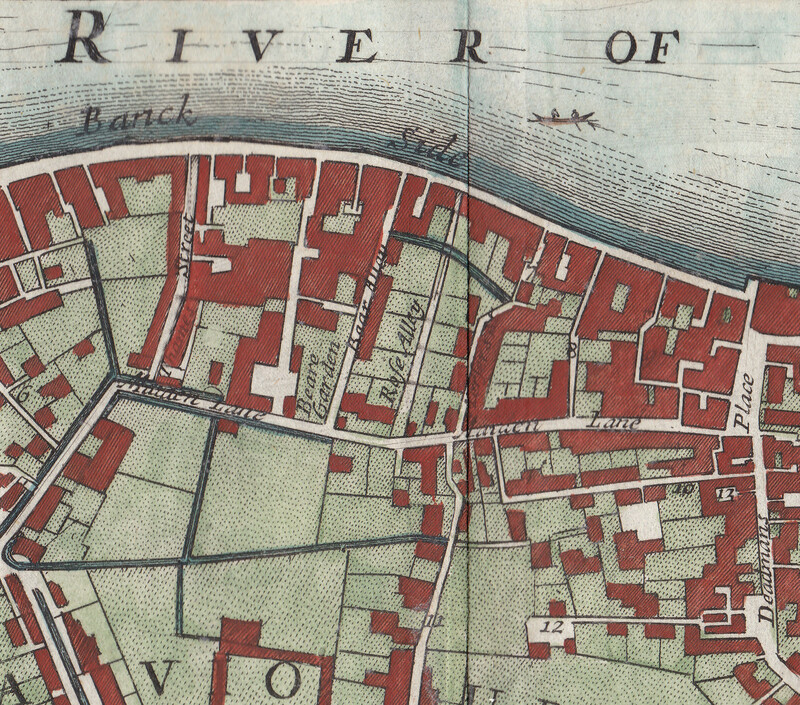 The following extract from a map of the Parish of St. Saviours Southwark by Richard Blome (late 17th century but published by John Stow in 1720) shows the area long before Southwark Bridge, with Banck Side (one of the spellings used in the 18th century) running along the edge of the River Thames. 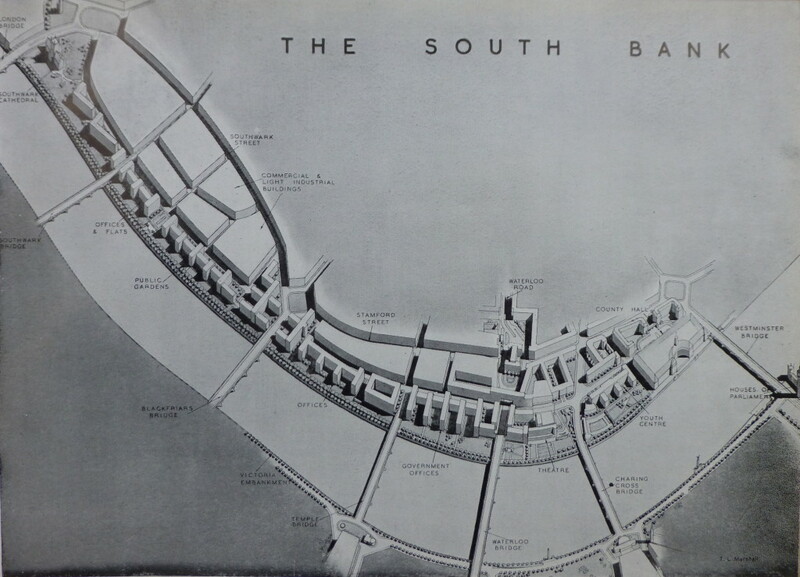 The first Southwark Bridge opened in 1819, 100 years after the map was printed. If you look in the centre of the map you will see Bear Alley. To the right is Rose Alley. There is a small street to the right of Rose Alley, which continues south to the bottom of the map. This is the location of Southwark Bridge. 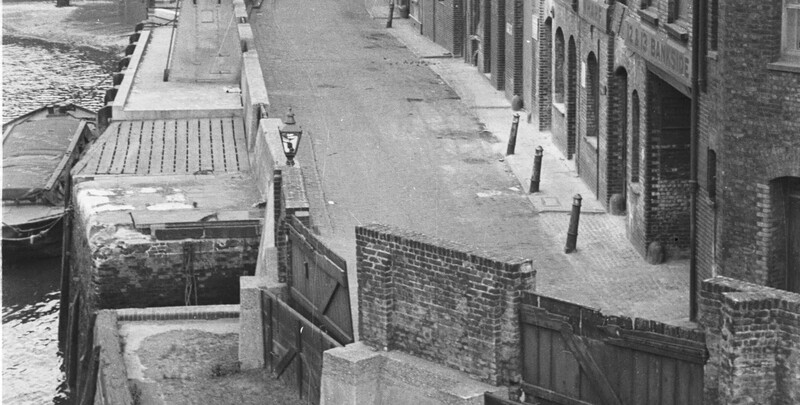 Bear Alley and Rose Alley are still there today, although Rose Alley is now blocked off from Bankside. 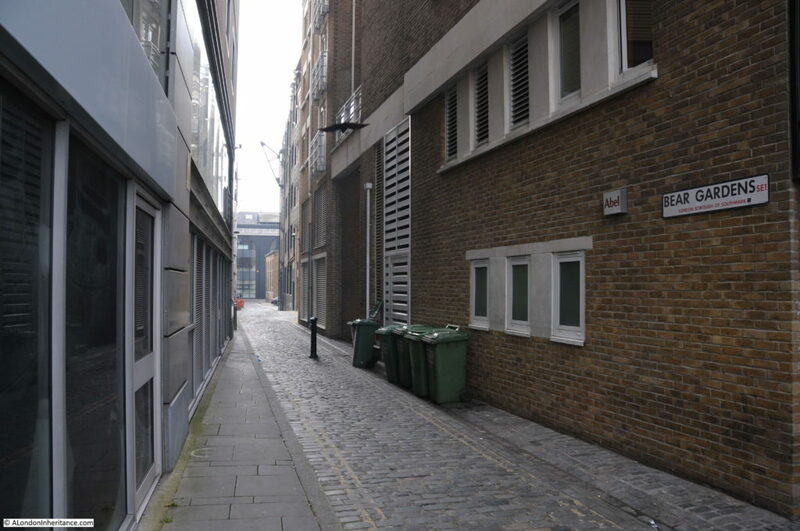 You can see that at the southern end of Bear Alley there is an open space marked as Bear Garden – one of the locations around Southwark that hosted the types of “entertainment” for which the area was well known. The following extract from the 1940 Bartholomew’s Atlas of Greater London shows Southwark Bridge with Bear Alley now called Bear Gardens. Note also that in both the 1720 and 1940 maps, Bankside was two words, Bank Side more accurately refers to the origin of the name. Today it is generally found as one word. Bear Gardens today is a narrow street running south from Bankside. Bear Gardens is always rather empty when compared to the crowd who seem fixed on walking the length of the south bank without exploring slightly inland. The construction of Southwark Bridge stopped Bankside from running alongside the river, it had to turn inland very slightly to run under the arches leading up to the bridge, before turning back towards the river. Just to the left of where the top photos were taken is where the street runs inland and it is here that, despite the incredible amount of change in this small area, the view today is remarkably similar to that of 64 years ago. My father took the following photo from under the warehouses that ran straight up to Southwark Bridge. Bankside turns to the right at the point where the photo is taken to run underneath the bridge. St. Paul’s Cathedral is behind the warehouses on the north bank of the river and Queenhithe is to the right of centre. Although the warehouses along Bankside have long since been demolished, the new buildings follow the same layout, with a remarkably similar view across to St. Paul’s Cathedral. 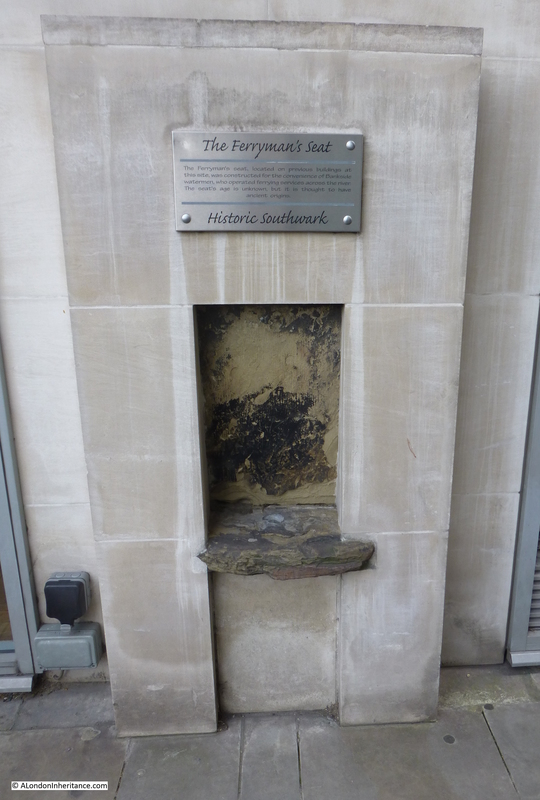 You can also see identical notches between the stone panels on the dark arch on the right of both photos, one of the arches that supports the run up to Southwark Bridge. I suspect that the solitary man cycling along Bankside in 1953 could never have imagined how this area would change over the following decades. This entry was posted in London Streets and tagged Bankside, Southwark Bridge on March 19, 2017 by admin. A couple of week’s ago, my post was on No.49 Bankside, one of the few remaining historic buildings in Bankside, and for this week, I have moved across to the other side of Tate Modern, and found how echoes of London’s long history are still visible today, despite what at first sight, appears to be a very recent landscape. My photo for this week from my father’s collection was taken in 1950. 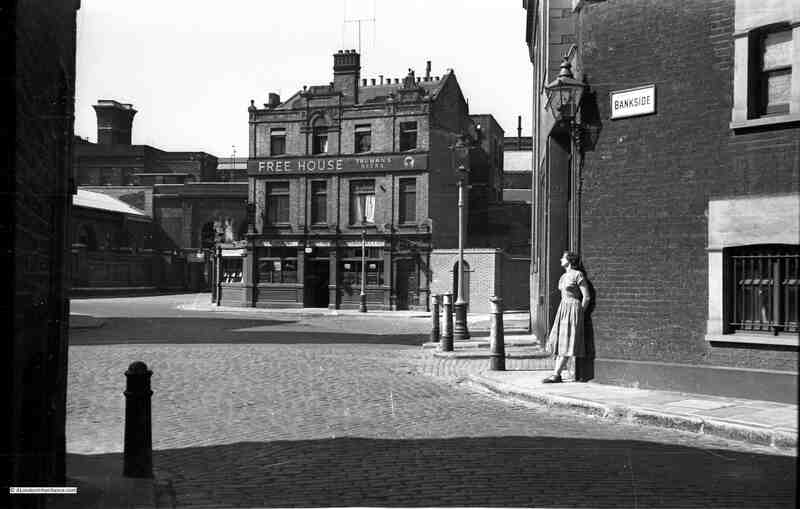 As the street sign confirms, it is on Bankside and looking across to a fine Victorian pub. This is the Founder’s Arms. Behind the pub is the viaduct, approaching Blackfriars railway bridge, carrying the rail lines across the Thames into Blackfriars Station. A couple of the arches underneath the railway can just be seen to the left of the pub. 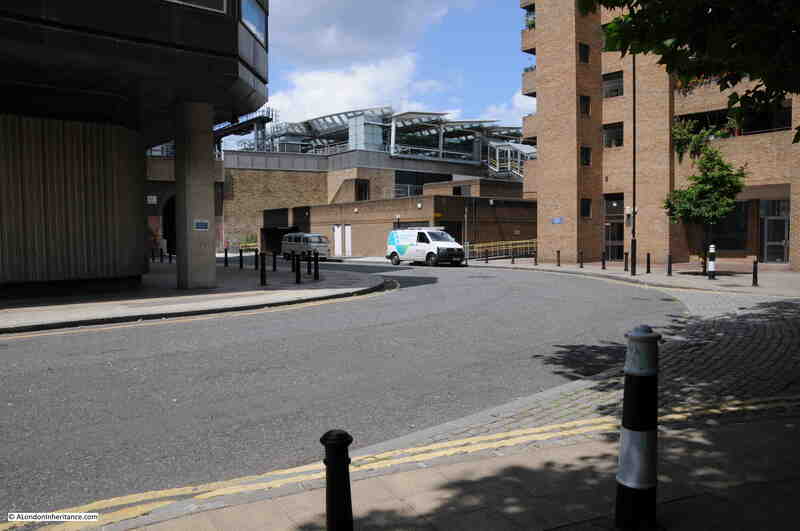 Although this part of Bankside has changed dramatically, it is relatively easy to place the location of the Founder’s Arms. The following is my 2015 photo, taken not quite from the same location as the new buildings on the right hide the view of the location of the pub, but using the arches in the railway viaduct and the road layout as reference points, where the pub once stood is now occupied by the single storey building behind the white van. The arches in the viaduct can just be seen on the left. To the right of the pub in the 1950 photo, the roadway continues down to the wharfs and stairs on the river. Although not a road, this is still a footpath shown in the 2015 photo by the yellow railings. 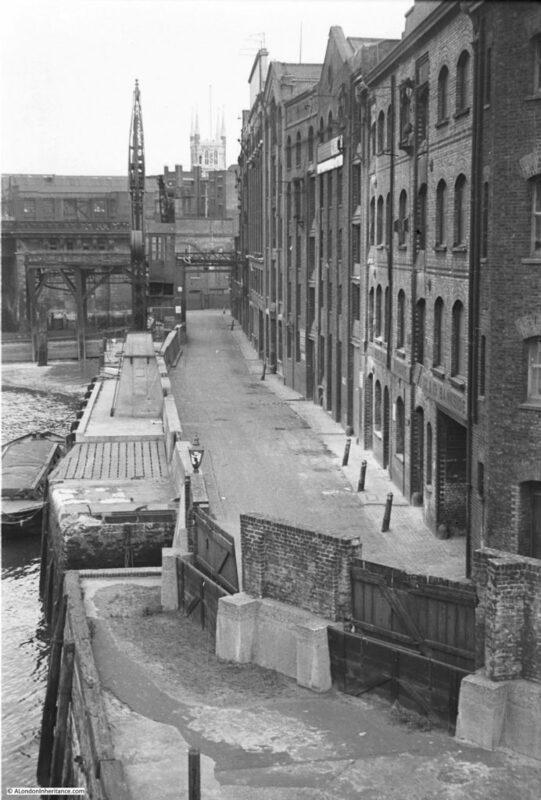 Bankside still curves to the right (although moved slightly away from the river, the original route now occupied by the buildings on the right), and in the 1950 photo, just visible to the left, two cobbled streets appear to be separated by a small part of pavement that extends into the centre left of the photo. To help understand the area in more detail, maps covering the last few centuries tell so much of how the area has changed, and what has remained. Below is the latest Google map of the location. Hopton Street is seen in the middle of the map, coming up to a T junction at the top, with just before this, a small side extension to join with Holland Street. Turn left at the T junction and the walkway to the river past the original location of the pub is shown in grey. The map still shows a Founder’s Arms, now directly on the river, I will come back to this later. Working back in time, the following map is from the 1940 Bartholomew’s Reference Atlas of Greater London and shows the road layout as it was at the time of the 1950 photo. I have marked the position of the pub with a red dot. Compare the roads Holland Street and Hopton Street. The 1940 map has these reversed compared to the Google map, and checking on site, Google is accurate, so was this just a map makers error? Going back 10 years to the 1930 version of Bartholomew’s Atlas and it is even more confusing. Look at the same location near the top of the following map and now both are called Holland Street with no mention of Hopton Street. I checked the 1913 version of the same Atlas (yes, sadly I do have multiple editions of the same London Maps !!) and the streets are both called Holland Street in this version as well, so I doubt this was an error. So now, let’s jump back much further to John Rocque’s survey of London from 1746. I have again marked the approximate position of the pub by a red dot. 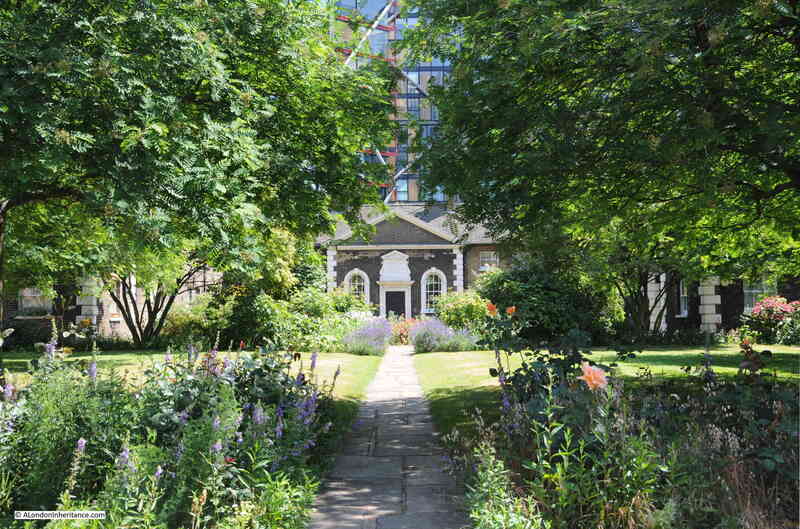 In the John Rocque map, the reference point we can use that is still there today are the Hopton Almshouses which can be seen along The Green Walk. 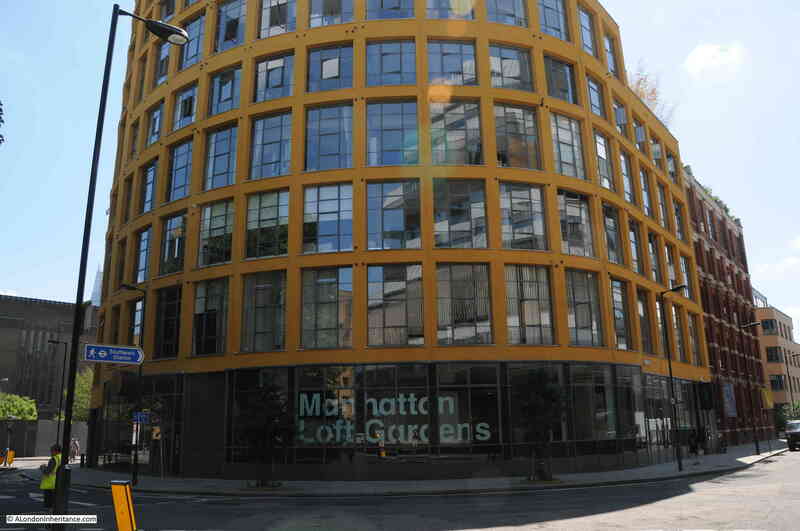 These can also be seen on the Bartholomew maps as the U-shaped building where Holland Street meets Southwark Street. So, in 1746, neither Hopton or Holland street names existed. Today’s Hopton Street was The Green Walk and today’s Holland Street was part of Gravel Lane. Holland was Sarah Holland who in 1631 had been charged as an “incontinent women” and imprisoned in Newgate. The Manor House was very suitable for her needs as she said it was “near the theatres and baiting rings, with their wild beasts and gladiators”. George Cunningham’s book was published in 1927 and there is no mention of Hopton Street. So that explains the source of the name Holland Street, but does not explain why or when The Green Walk and Gravel Lane changed their name. 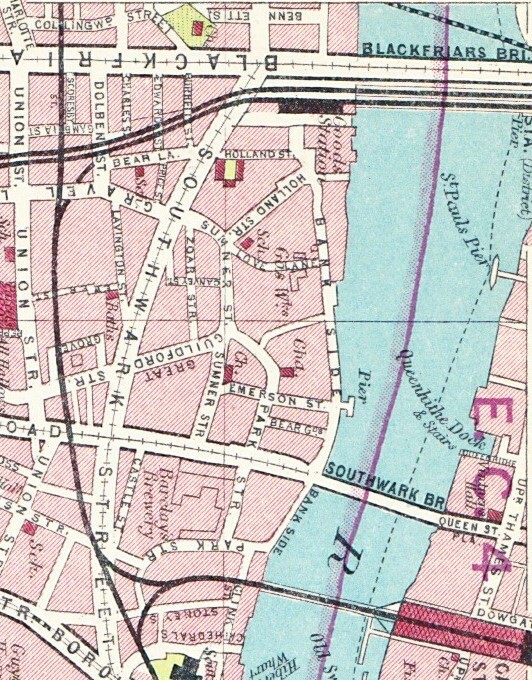 The 1913 Bartholomew Atlas is therefore correct by labelling the two streets (which were in effect one, looping back after reaching Bankside) as Holland Street. In the original The Green Walk are Hopton’s Almshouses. These were built around 1749 for “twenty-six decayed house-keepers, each to have an upper and lower room with £10 per annum and a chaldron of coals.” They have been occupied continuously since July 1752. The money (and name) for these came from one Charles Hopton who on his death left a large sum of money to his sister, and on her death the money was used to build the Almshouses. Hopton was born around 1654 into a wealthy merchant family and was a member of the Guild of Fishmongers. 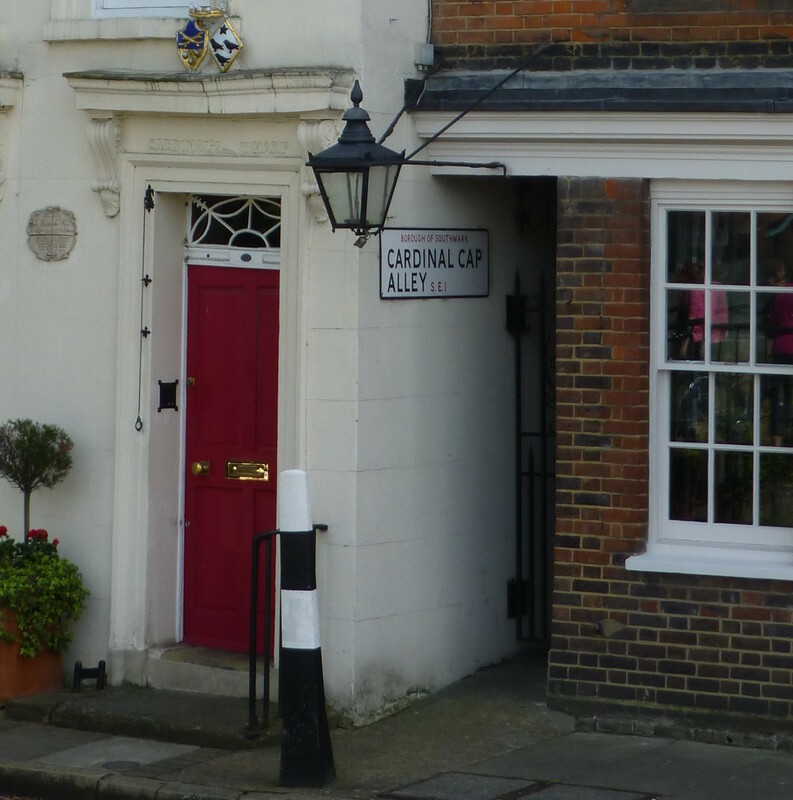 In 1831 there is a description of these as being “those of Mr Hopton in Green Walk” – so it appears the name had not changed to Holland Street by 1831. By the time of Edward Walfords Old and New London (1890) the name had changed to Holland Street. Hopton Street has one further surprise. This is No. 61 Hopton Street, or when it was first built, No. 9 Green Walk and is the oldest building in the area. One of a number of houses built by James Price around 1703. This is the sole survivor and is surrounded on all sides by much later (and much larger) additions to Hopton Street. The changes that this house has seen over the centuries must be quite remarkable. The change of part of Holland Street to Hopton Street probably occurred around the mid 1930s. In Grace Golden’s history of Old Bankside, published in 1951, she refers to: “An apparently puritanical drive has recently changed Holland into Hopton Street, named after Charles Hopton”. Also, the licensing records for the Founder’s Arms state that the original address was 8 Holland Street and the address was changed to 56 Hopton Street between 1934 and 1938. From this, I assume that in the 1930s, there was an initiative to change from Holland to Hopton Street to erase the reference to what must have effectively been a brothel kept by Sarah Holland at the old Paris Garden’s Manor House. 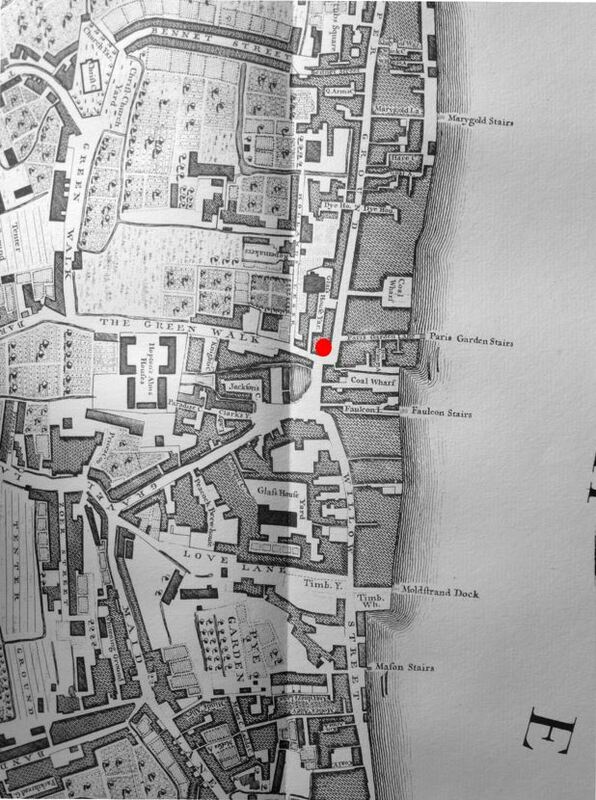 If you return to the John Rocque map from 1746 and look on the river’s edge to the lower right of the red circle you will see Faulcon Stairs, one of the many old stairs that led down to the river. 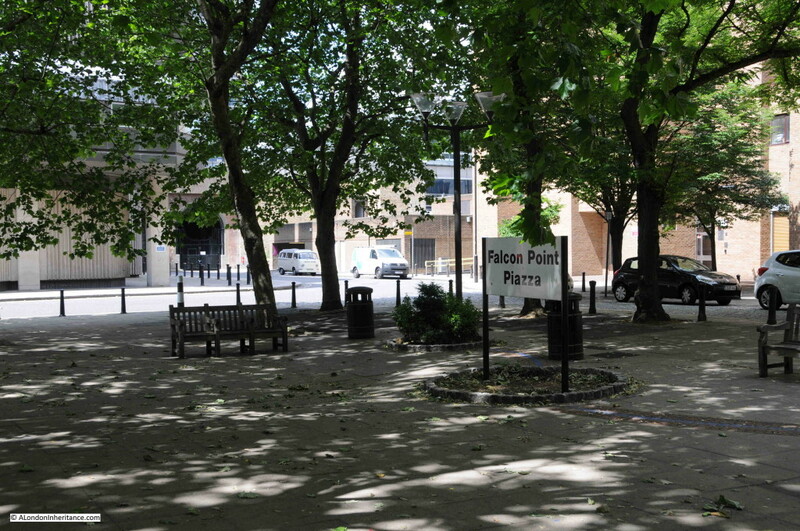 The earliest explanation I can find for the name is from the sport of Falconry that took place in the Paris Gardens that occupied much of this area, so the buildings and the Piazza both retain the name of a sport that took place here hundreds of years ago. The Falcon name has other associations with the area. Writing of the Glass Works in 1843 in his History of Surrey, Brayley states that “Their present importance and excellence are mainly due to the taste and exertions of the present proprietor and the employment of skilful hands on materials that science and experience approve. By these means the most elegant productions of the Continent are advantageously rivalled, and in some respects surpassed”. I have read, but have been unable to corroborate, that the source of the name Founder’s Arms was due to the Glass Works or Foundry as a “Founder” is also an operator of a Foundry. 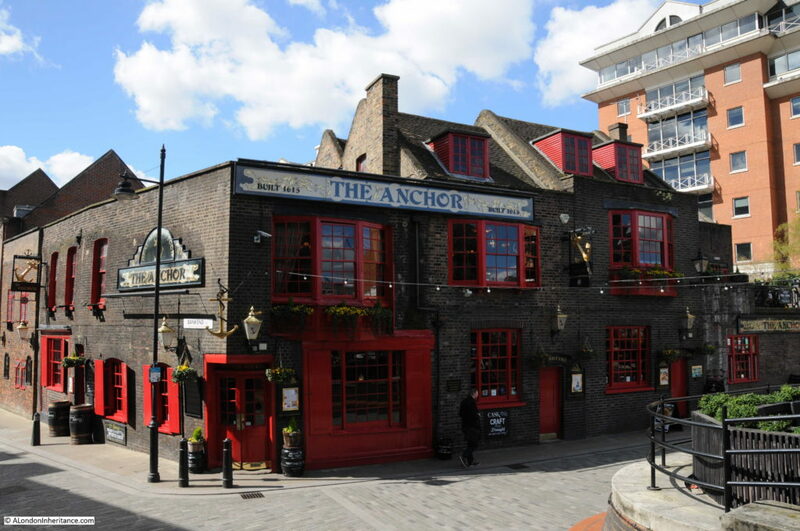 In addition to the Founder’s Arms, there was a much earlier pub on the site of the Falcon Drawing Dock, (closer to the river, near the stairs). 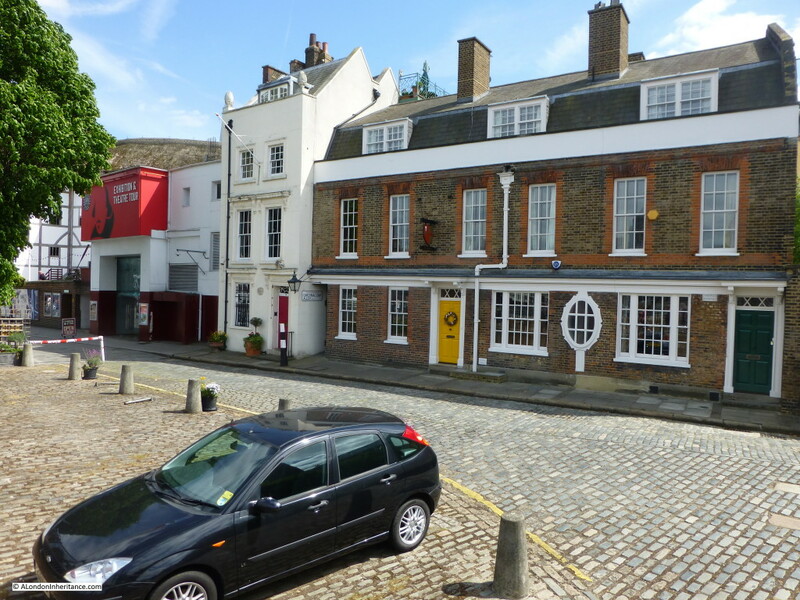 This was the Falcon Tavern which was allegedly used by Shakespeare, but was definitely a major coaching inn, acting as the terminus for coaches to Kent, Surrey and Sussex. 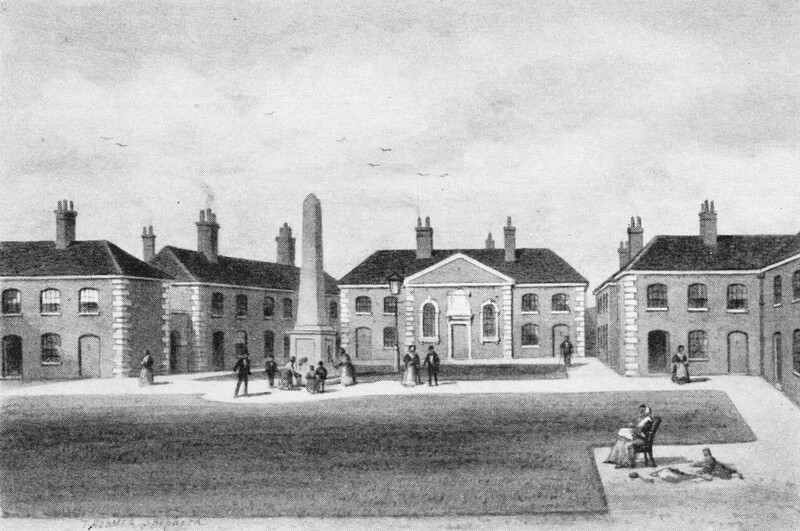 The Falcon Tavern was demolished in 1808. Now if we walk past where the Founder’s Arms use to be back up to the walkway along the river we find both the latest the latest incarnation of the Founder’s Arms and steps leading down to the river, roughly in the location of the Falcon Stairs (I say roughly as with the building of the walkway and other changes it is impossible to be precise). A very different pub to the Victorian original but good that for at least 176 years (the earliest record I can find for the Founder’s Arms is from 1839) a pub with the same name has been found in this small area of Bankside. A rather convoluted story, but one that demonstrates how much is to be found in one very small area of London, and that despite so much reconstruction and change, links with the history of the site are still there to be discovered. This entry was posted in London Pubs, London Streets and tagged Bankside, Falcon Glass Works, Founders Arms, Holland Street, Hopton Street, Southwark on July 5, 2015 by admin. If you visit Bankside today, by far the main attraction is the reconstruction of Shakespeare’s Globe Theatre, however I would argue that there is a far more important historical building right next door to the Globe. 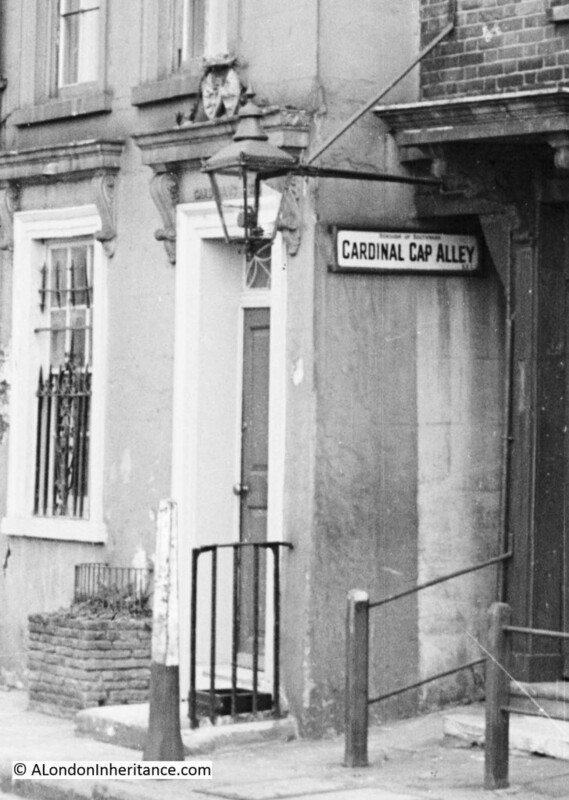 The following photo was taken by my father in 1947 and shows Cardinal Cap Alley. The building on the left of the alley is No. 49 Bankside, a building that exists to this day and has somehow managed to survive the considerable rebuilding along Bankside, and whilst having a well documented history, No. 49 also pretends to be something which it is not. In the above photo, No. 49 and Cardinal Cap Alley are between one of the many industrial buildings along Bankside (Craig & Rose, paint manufacture’s ) and a short terrace of houses that were damaged by bombing in the last war. The following photo is my 2015 view of the same area and shows No. 49 and Cardinal Cap Alley are now in between the Globe and the rebuilt terrace of houses, which were also reduced from three down to two houses in the post war reconstruction. Cardinal Cap Alley and No. 49 have a fascinating history that tell so much about how Bankside has changed, and also how the history of the site can be traced to what we see along Bankside today. “The name Cardinal’s Hat (or Cap), for a house on the site of the present No. 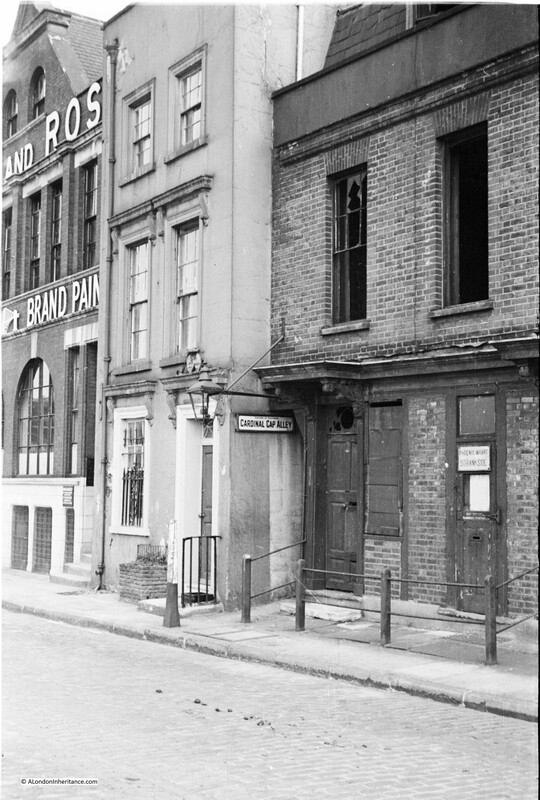 49 Bankside, and for the narrow alley which runs down beside it, dates from at least the time of Elizabeth and perhaps earlier. The suggestion that it was named in compliment to Cardinal Beaufort is attractive but untenable, for Beaufort died in 1447, and the original Cardinal’s Hat was not built till many years later. The site was described in 1470 as “a void piece of ground”. It is possible that it was named after Cardinal Wolsey who was Bishop of Winchester from 1529-30, although no buildings are mentioned in a sale of the site from John Merston, fishmonger, to Thomas Tailloure, fishmonger in 1533. Stowe lists the Cardinal’s Hat as one of the Stewhouses but he may possibly have been mistaken, including it only because it was one of the more prominent inns on Bankside in his day. It is shown in the Token Book for 1593 as in occupation of John Raven and as one of a group of houses which in the book for 1588 is described as “Mr. Broker’s Rentes”. Hugh Browker, later the owner of the Manor of Paris Garden, was in possession of ground there in 1579 and it seems likely that he was responsible for the formation of Cardinal’s Cap Alley if not for the building of the original house. Thomas Mansfield was the tenant of the inn when Edward Alleyn dined there with the “vestrye men” of St. Saviour’s parish in December 1617. A few years later John Taylor, the water poet makes reference to having supper with “the players” at the Cardinal’s Hat on Bankside. Milchisedeck Fritter, brewer, who tenanted the house from 1627 to 1674 issued a halfpenny token. He was assessed for seven hearths in the hearth tax rolls. 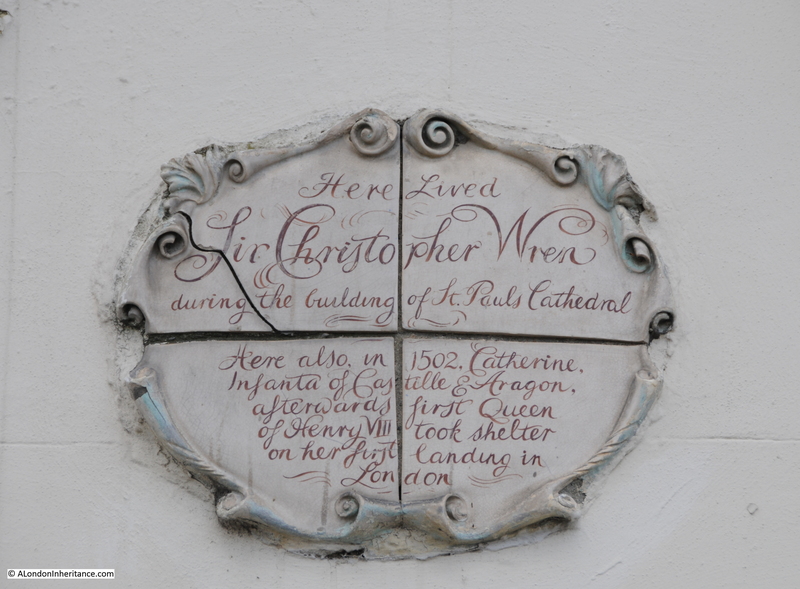 Although today the main Bankside attraction is the adjacent Globe Theatre, what does draw the attention of visitors to Bankside is the old looking plaque on No.49 with ornate script stating that Sir Christopher Wren lived in the building during the construction of St. Paul’s Cathedral and that Catherine of Aragon took shelter in the building on her arrival in London. This can be seen to the left of the doorway to No. 49 in my 2015 photo. But a close-up of the 1947 photo shows no evidence of the plaque to the left of the door and there is no mention of it in the 1950 Survey of London. The origin of this plaque is documented in the really excellent book “The House by the Thames” by Gillian Tindall. As the name suggests, the book is about the history of No. 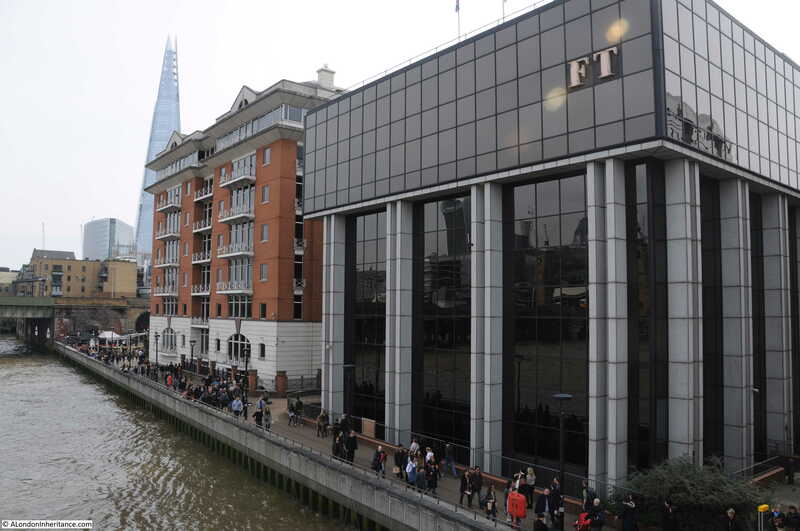 49 Bankside, the occupiers of the house and the industries around Bankside. It is one of the most interesting and well researched accounts of a single house and its’ surroundings that I have read. In the book, Tindall confirms that the plaque is a mid 20th Century invention. Malcolm Munthe, who purchased the house just after the end of the war, probably made the plaque himself and installed on the front of the house. 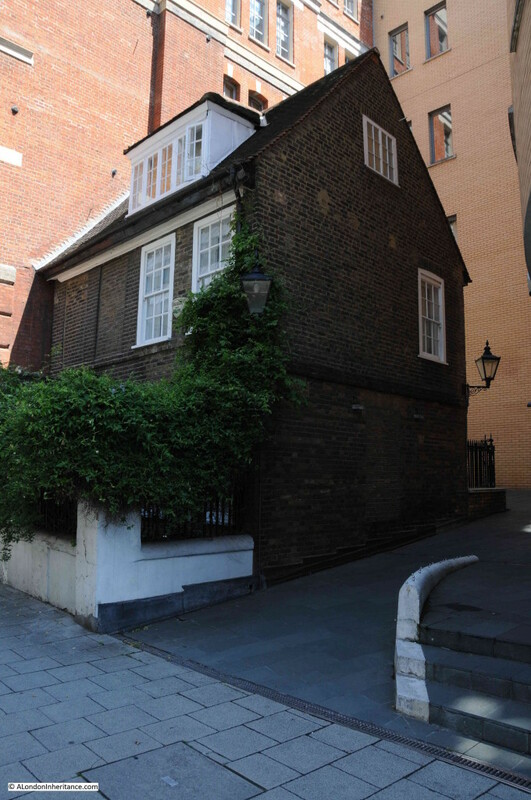 There was a plaque on a house further up Bankside, claiming the occupancy of Wren, however this house was pulled down in 1906. A close-up of Cardinal Cap Alley and the entrance to No. 49, showing the Wren plaque to the left of the door. Also note that Cardinal Cap Alley is now gated. 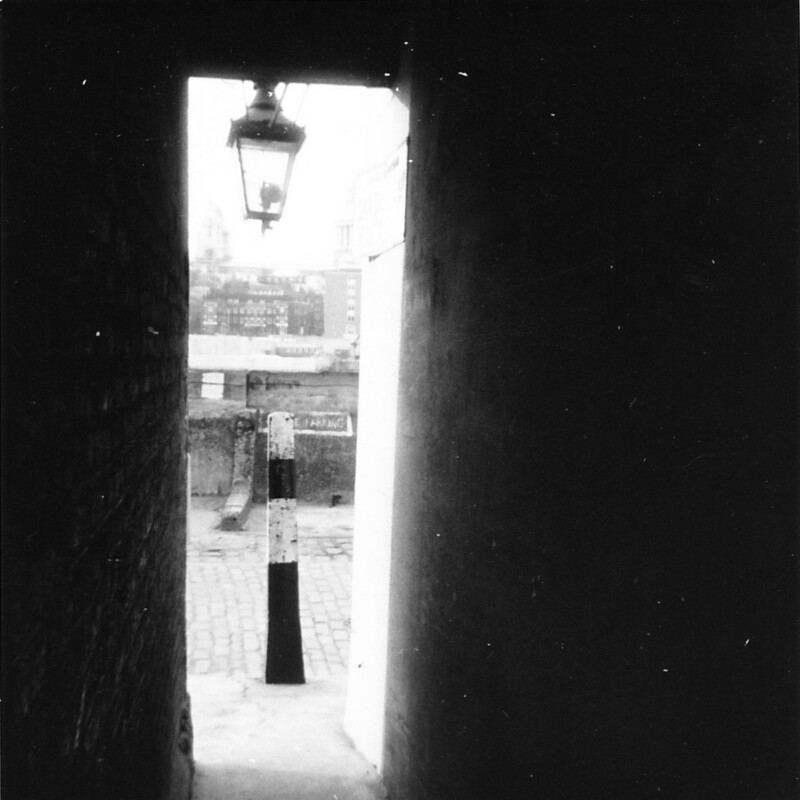 This use to be freely accessible and I took the following photo from inside the alley in the 1970s. Could not deal with the contrasting light very well, I was very young and this was with a Kodak Instamatic 126 camera – my very first. 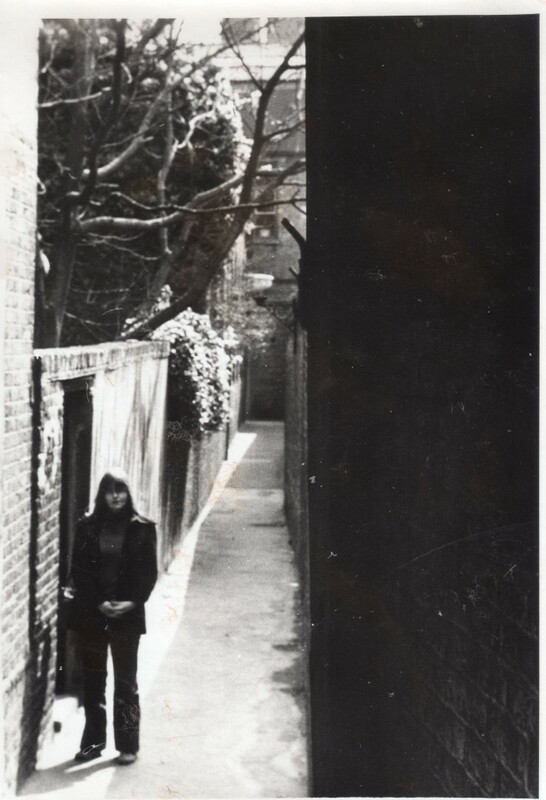 I did not take a photo looking down into the alley, probably thinking at the time it was not as good a view as across the river, however it is these views which are so important as they show, what at the time, are the day to day background of the city which are so important to record. The garden of No. 49 is on the left. Just an ordinary alley, but so typical of all the alleys that would have run back from the water front, between the houses that faced the river. Tindall’s book runs through the whole history of No.49 and demonstrates how the history of a specific site over the past centuries has influenced the site to this day. The occupiers of No. 49 and the adjacent buildings ran the ferry boats across the river, were lightermen and watermen and then moved into the coal trade. The Sell’s family who lived in the house for a number of generations, and who built a very successful coal trading business, finally merging with other coal trading companies to form the Charrington, Sells, Dale & Co. business which generally traded under the name of Charrington (a name that will be very familiar to anyone who can remember when there was still domestic coal distribution in the 1960s and 1970s). 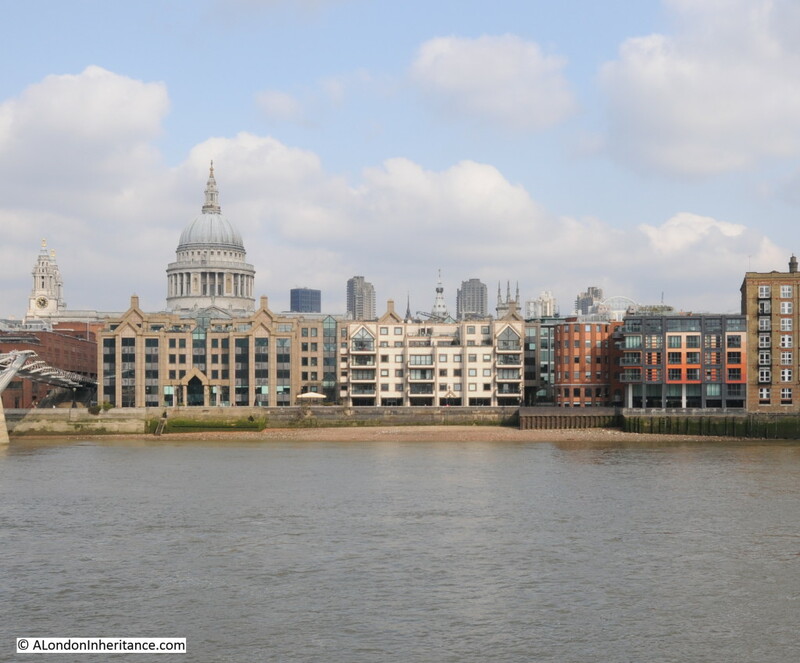 – the original occupations of many Bankside residents of ferrymen, lightermen and watermen. Working on the River Thames with the transportation of people and goods. – the first electricity generating plant being replaced by the Bankside Power Station that we see today and is now Tate Modern. “And this is why at the end of the twentieth century, a huge and distinctive brick red building was there to make an iconic focus for the regeneration of a Bankside from which industrial identity had by then fled. This last paragraph sums up my interest in the history of London far better than I could put into words. I really do recommend “The House by the Thames” by Gillian Tindall. Standing in Bankside today, the area could not be more different. Another view of No. 49 Bankside. The street in front of these buildings is the original Bankside. As can just be seen, this comes to an abrupt stop due to the land beyond being occupied by the Bankside Power Station complex. It is perhaps surprising that N0.49 and Cardinal Cap Alley have survived this long given the considerable redevelopment along this stretch of the river. It is ironic that perhaps the false plaque claiming Sir Christopher Wren’s occupancy may have contributed to the survival of the building during the last half of the 20th century. 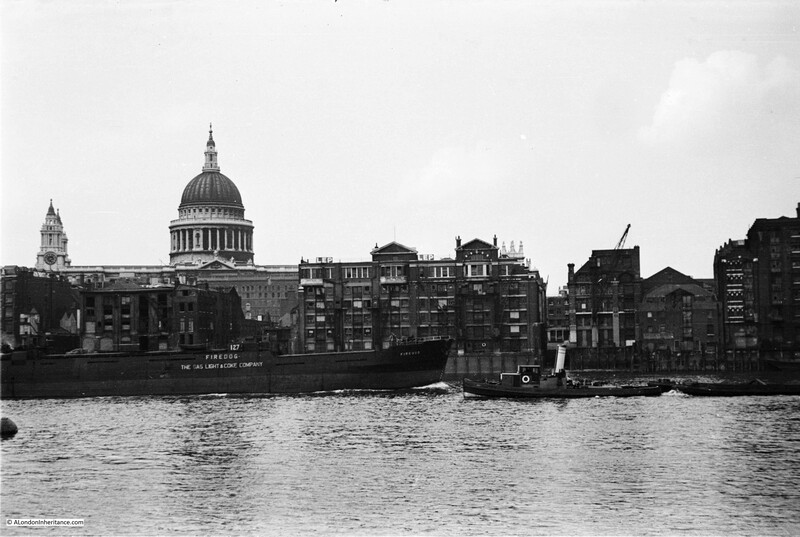 My father also took a photo from Bankside across the river to St. Paul’s Cathedral. The larger ship traveling from left to right is the Firedog, owned by the Gas Light & Coke Company. Originally founded in 1812, the company had a fleet of ships to transport coal to the gas works it operated around London (this was before “natural” gas was discovered in the North Sea. Prior to this, gas was produced from coal). The Gas Light & Coke company absorbed many of the smaller companies across London before being nationalised in 1948 as a major part of North Thames Gas, which was then absorbed into British Gas. The same view in 2015. The only building on the river front to have survived is the building on the far right. Note the building in the middle of the 1947 photo. This is the head office of LEP (the letters can just be seen on the roof), the company that operated the last working crane on the Thames in central London, see my earlier post here. It is really good to see that the height of the buildings between the river and St. Paul’s are no higher today than they were in 1947. A very positive result of the planning controls that protect the view of the cathedral. Read Gillian Tindall’s book, then visit Bankside. Ignore the crowds around the Globe and reflect on Cardinal Cap Alley, No. 49 and the lives of countless Londoners who have lived and worked on Bankside over the centuries. This entry was posted in London Buildings and tagged Bankside, River Thames, St. Paul's Cathedral, The Globe on June 21, 2015 by admin.